© 2007-2019, Kevan Hashemi Open Source Instruments Inc.
[12-OCT-16] Our Subcutaneous Transmitters (SCTs) are small, battery-powered sensors designed to be implanted beneath the skin of laboratory animals or mounted upon their skulls as head fixtures. Each SCT measures one or more biopotentials. The SCT samples biopotentials with sixteen-bit precision and transmits them by radio waves. The batteries in our implantable transmitters cannot be replace, but the batteries in our head-fixture transmitters may be replaced easily by hand. A Subcutaneous Transmitter System consists of SCTs, antennas to pick up their radio-frequency transmissions, amplifiers and demodulators to detect and decode these transmissions, communication hardware to permit data acquisition computer over ethernet, and software to record and analyze the data. Each system can monitor up to 196 single-channel transmitters or 98 dual-channel transmitters. The animals in which these transmitters are implanted can live together in one huge cage, or several cages, or in separate cages. Most SCT systems use Faraday enclosures to keep local radio-frequency interference away from the receiving antennas, to block ultrasonic noise that would otherwise disturb the animals, and to contain the radio frequency transmissions of the implanted transmitters so they do not violate local regulations. 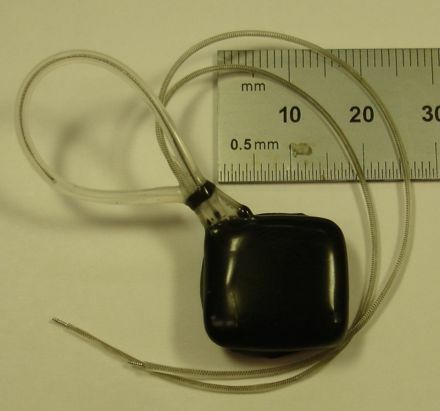 Figure: Encapsulated Two-Channel Subcutaneous Transmitter, A3028A. The leads are helical stainless steel insulated with silicone. The antenna is stranded stainless steel insulated with silicone. The transmitter volume is 1.4 ml, not counting the leads and antenna. Operating life is two weeks running both channels at 512 SPS. An SCT system consists of a data acquisition and power supply assembly called the LWDAQ Driver such as the A2071E, a radio frequency data receiver such as the A3027E, one or more Faraday enclosures, up to sixteen antennas such as the A3015C, and up to fourteen subcutaneous transmitters implanted in animals. In addition, we may have location tracking platforms beneath some or all of the animal cages to monitor the location and movements of the animals. These location trackers, such as the A3032A, use signals from the data receiver and communications via their own connection to the LWDAQ driver. The schematic below attempts to clarify the arrangement of the system components. Figure:Schematic of SCT System with Octal Data Receiver. 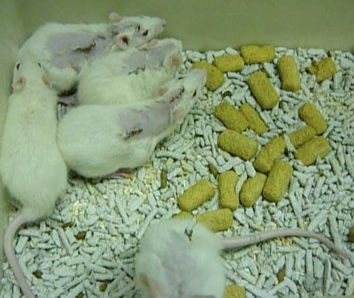 In this example, we are recording from thirty mice in six cages within an IVC rack. To ensure reliable reception within the IVC rack, we surround it with a Faraday enclosure made of steel mesh fabric with doors sealed with zippers, and we add a wall of microwave absorbers at the back. The SCTs will monitor electroencephalograph (EEG), local field potential (LFP), electrocardiogram (ECG) or electromyography (EMG). We describe the sources of EEG and LFP in The Sources of EEG. For recordings from live animals, see our Example Recordings page. Our A3028 series of subcutaneous transmitters supports sample rates up to 4048 SPS. For recording EEG, most of our customers choose a bandwidth of 0.3-160 Hz with a sample rate of 512 SPS. The primary purpose of the system is to record biopotentials continuously for weeks at a time and to analyze these recordings reliably and automatically. When recording EEG in epileptic animals, for example, we will want to count seizures automatically in tens of thousands of hours of recording. The A3028A provides two input channels, allowing EEG to be monitored in two locations. Its volume is 1.4 ml, which fits easily into an adult mouse. It samples its X and Y inputs at 512 SPS each, and its amplifiers provide bandwidth 0.3-160 Hz. It runs for 360 hrs. The X and Y inputs share the same common terminal, so there are three leads emerging from the device, plus the antenna. The A3028B is the same size as the A3028A, but provides only the X input and runs for 600 hrs. The A3028D is electrically identical to the A3028A, with a larger battery. It's volume is 2.8 ml and it runs for 1900 hrs. The A3028E is also 2.8 ml, but provides only the X input and runs for 3200 hrs. Figure: SCT System with Animal Location Tracking. A data acquisition computer (1) is connected via a TCPIP network (2) to a LWDAQ Driver (3), which receives power from a 24-V adaptor (4). A shielded CAT-5 cable (5) makes the LWDAQ power and signals connection between the driver and the Octal Data Receiver (6). Eight coaxial cables (7) carry antenna signals to the Octal Data Receiver amplifier inputs. Loop antennas (8) pick up signals from implanted transmitters. Three Faraday enclosures (9) isolate a total of fourteen animals from other SCT systems and local radio-frequency interference. Six animals are living on two Animal Location Tracker platforms (10), which each are connected to the LWDAQ Driver with their own LWDAQ cable, and also to the Octal Data Receiver with a USB cable (11). All cables entering the Faraday enclosures are shielded cables and pass through grounded feedthrough connectors (12) at the wall of the enclosure. Provided they operate in different Faraday enclosures, or at a distance more than 60 cm apart in a large Faraday enclosure, we can connect two antennas to the same antenna amplifier using a BNC T as a combiner of their signals. Reception of our telemetry signals is always limited by radio-frequency interference. Our faraday enclosures reduce ambient interference by a factor of one thousand. Where a single antenna receives the signal from an implanted SCT 95% of the time, two independent antennas pick up the signal 99.5% of the time. Our Octal Data Receiver (A3027) provides eight independent antenna inputs. Each input has its own amplifier, demodulator, and decoder. By distributing these antennas between our animal cages, the probability that at least one of them will receive any particular message approaches 100%. With eight antennas distributed through an IVC rack, for example, we obtained 100% reception everywhere within the rack, despite the presence of a 900-MHz mobile phone base station 80 m from the recording room. One Octal Data Receiver can record from dozens of animals in one such IVC rack. Our FE3A enclosure stands on its own, and is 90 cm wide, 60 cm high, and 65 cm deep. With a shelf half-way up, it holds six animal cages. With four antennas inside, it will provide robust recording from forty co-habiting animals. Nevertheless, faraday enclosures and multiple antennas cannot overcome the most severe interference a crowded city can produce. In our laboratory, a 1-W interference source at range 1 m will cause 50% loss of signal from a moving transmitter in a faraday enclosure equipped with two independent antennas. By application of the inverse square law, we expect a 3000-W 900-MHz GSM base station 55 m away to be capable of similar disruption. The power emitted by a mobile phone base station spreads out like the beam of a flash-light. If you are nearby but below the station, you can receive less power than if you are farther away but at the same altitude, and if the station is on a neighboring building, you will receive more power than if it is mounted on your own building. If your recording room is less than 100 m from a base station, and directly in the path of its transmit beam, we will advise you on how to proceed tomake sure your SCT system will provide robust reception. In our conclusion, we give examples of subcutaneous transmitter systems and their performance. You will find the prices of subcutaneous transmitter system components in our price list. In the body of this report, we describe the performance and operation of our Subcutaneous Transmitter hardware. The descriptions are mingled with the history of our development, which makes them long-winded. For that we apologize. We have done our best to extract as much of the history as possible and place it in our history section. Our Seizure Detection page gives a history of our automatic event detection software. If you can't understand our radio-frequency terminology consult our terminology page, where we define the terms RF, IF, LO, mixer, attenuator, dBm, and dB. We explain the significance of 50 Ω in our circuits, and we provide a table that relates power in 50-Ω circuits like our to signal amplitude. [21-MAY-14] Our Subcutaneous Transmitter (A3028) provides one or two, depending upon how it is configured. Our Data Receiver (A3037) comes in a 30 cm × 22 cm × 11 cm metal box. The box connects to our LWDAQ data acquisition system through an RJ-45 connector. It receives power through the same connector. Eight BNC sockets on the back of the box provide connections for a coaxial cables to the antennas. There are thirty indicator lights on the front of the box. There is one white light for each transmitter channel, one white light for each antenna input, and power, reset, upload, and empty lights. The Octal Data Receiver comes with eight Dampled Loop Antenna (A3015C). These attach to the antenna inputs with 240-cm coaxial cables. Each antenna can stand on its own, or we can take the mounting brackets off and lay it on a table or wedge it between the cages in an IVC rack. When first setting up a system, we recommend you do so with the help of a Faraday enclosure such as the front-loading, stackable FE2C, which is large enough for two rat cages. Within an Faraday enclosure you are sure to get perfect reception, and by opening the enclosure door, you can determine how severe your local interference is. If you want to operate in a larger space, such as an IVC rack, you can set up a Radio-Frequency Isolation Chamber. 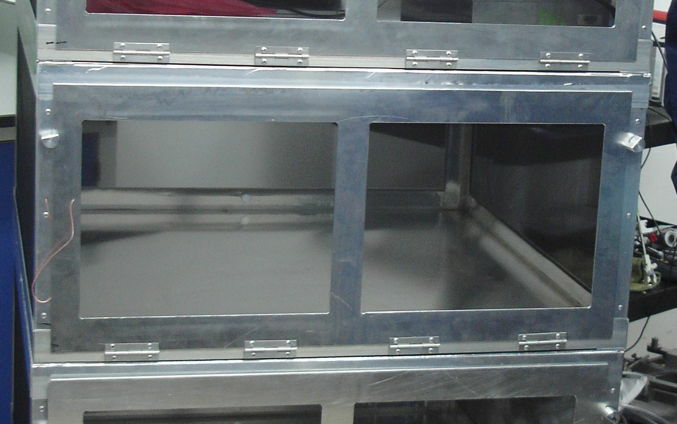 These chambers are straightforward to construct our of microwave absorbing foam and steel mesh fabric. We present a prototype here. Gaps between the walls are well-tolerated by the system because the isolation chamber needs to attenuate ambient interference only by a factor of four to guarantee adequate reception with the octal data receiver, even in urban laboratories. Radio frequency isolation chambers are a new development in 2014, and we believe laboratories can put these together themselves with our advice. So we do not have a part number for a specific isolation chamber design. [27-NOV-15] Here is a list of parts you need to set up a new recording system. All parts are supplied by Open Source Instruments, except for the first one: the power cable. The power cable is a computer power cable left-over from a retired PC or monitor. We don't ship these because they have to have your local power plug on the end, and we know that everyone has plenty of them stashed away in a draw in their lab. Recommendation: Set up your SCT recording system several weeks before you plan to perform your first animal experiments. During these weeks, you can install the LWDAQ software and learn how to acquire and analyze transmitter signals. In particular, we recommend that you place one or two transmitters within a Faraday enclosure and record their signals continuously for at least a week, in order to make sure that your computer, local area network, and hardware is functioning correctly. Recording might be interrupted every few hours, and you will be glad to figure out what causes these interruptions before you have animals with transmitters implanted. Reception from the transmitters may cease all-together every few hours, and you will be glad to figure out what is interfering with reception long before you have begun an experiment with live animals. Assuming you have the above parts in hand, follow these steps. They will take you through the set-up of the hardware and software, so that by the end you will be able to record and analyze transmitter signals. Connect Power to Driver: The power supply provides 24-V for the LWDAQ Driver. We don't provide the power cord that runs from your native wall socket to the power adaptor's industry-standard AC power plug. We leave it to you to dig out an old computer or monitor power cord for use with the power adaptor. Your power cord will be compatible with your own native wall socket. There is a DC power jack on the LWDAQ Driver. Plug the power adaptor in here. Some of the indicator lights on the front side of the driver should turn on, to indicate the power supplies inside the driver are working. Connect Driver to Laptop: Plug an ethernet cable into the ethernet socket on the LWDAQ Driver. We ship our LWDAQ Drivers with blue, unshielded ethernet jumper cables for this purpose. On the A2037E, the ethernet socket is the one on the back, next to the power jack. The driver has other sockets of the same type as the ethernet socket, but these are not ethernet sockets. They are LWDAQ driver sockets. You can plug your ethernet cable into them if you like, but it won't do you much good. On the other hand, you won't break anything either. Plug the other end of your ethernet cable directly into your laptop computer. Download the LWDAQ Software suitable for your computer's operating system from the LWDAQ software download page. Go to our Software Installation section and follow the instructions for your operating system. Go to our Configurator section and follow the instructions to establish communication between your computer and the LWDAQ Driver. You will set up your computer to operate on a local network that contains only the computer and the driver. We have done this a bunch of times, so it takes us less than a minute. But the first time you try it can be frustrating. Connect Driver to Local Area Network: Once you have established communication between your computer and the driver, you may wish to configure the driver with an IP address in your local area network, so that you can plug it into one of your lab's ethernet sockets and communicate with the driver from anywhere on the Internet. Once again, follow the instructions in the Configurator section of the manual. You may find this step takes a while to accomplish because you will have to work with your network administrator to obtain an Internet address, and they may not be happy about allowing you to put a strange device like the LWDAQ Driver on their network. You must obtain permission from them to allow connections on port 90 of the LWDAQ Driver. Test Control of LWDAQ Power Supplies: You can test communication between your computer and the LWDAQ Driver at any time with the Diagnostic Instrument. Try turning on and off the LWDAQ power supplies and obtaining plots of the power supply voltages. When you turn off the power supplies, you will see the three power supply lights turn off. Connect the Data Receiver: Connect your data receiver (such as the Octal Data Receiver, A3027) to your LWDAQ Driver (A2071E or A2037E) with a shielded LWDAQ Cable. We ship the data receivers with a shielded cable for this purpose. The shielded cable protects data acquisition from static discharge. Pick one of the LWDAQ sockets on the driver for the connection. Any one will do. Socket number one is the one closest to the indicator lamps. Socket number eight is the one farthest from the indicator lamps. Let's suppose you pick socket number one. You should see a power light come on the Data Receiver. If not, press the hardware reset button on your LWDAQ Driver to bring up the power supplies again. The hardware reset button is next to the indicator lights. Open the Recorder Instrument in the LWDAQ Software. Specify the LWDAQ Driver IP address and the driver socket of the Data Receiver. Press Reset to clear the signal buffer on the Data Receiver. You should see the red light on the Data Receiver flash briefly. Now press Loop. You should see the clock signal on the screen. Press Stop. Connect One Antenna: Connect a long coaxial cable to one of the antenna sockets on the data receiver. Whenever you connect a BNC plug to a BNC socket, make sure that you turn the locking flange on the plug until it locks. If you don't lock the connector, your system will still work, but it will work poorly now and then, which makes for a difficult problem to diagnose. Plug the other end of your long coaxial cable into one of your Loop Antennas (A3015C). Put the antenna on your work bench. Even if you have a Faraday Enclosure, don't start working with it yet. We are going to test transmission in the open air. Turn On Transmitter: Take your transmitter and place it next to the antenna. If it's off, bring your magnet next to the transmitter and move it away again. One of the channel activity lights on data receiver should turn on, and at least one of the antenna activity lights as well. If not, try again with the magnet. The transmitter should turn on and off easily. If not, your magnet is not powerful enough or it is too small. The magnets we provide are big and strong. Hold the transmitter in your hand and move it around near the antenna. You should see the Channel Receive light turning off now and then, or it may be intermittent. If you move far enough from the antenna, the light will certainly turn off. The light indicates signal reception. When reception is robust, the intensity of the Channel Receive light is constant. View Transmitter Signal: In the Recorder Instrument, press Reset and Configure then Loop. You should see the signal from your transmitter displayed on the computer screen. Wet your finges and press the transmitter leads together. You will see noise. The noise on the A3028B input is around 20 counts. Other versions may have more or less noise. Separate the leads. You should see mains hum (50 Hz or 60 Hz). Wet the thumb and forefinger of both your hands and hold the tip of each lead in one hand. Rest the transmitter on your bench with the two leads running close together. Try to stay still. You should see a small bump in the received signal every second or so. This bump is your heartbeat. Test Reception: Place the transmitter near the antenna. Press Reset and Configure and Loop in the Recorder Instrument. You will see a status line below the signal display. This line tells you how many messages are being received from each active channel during each recording interval. By default, the recording interval is 1 s, so you will get 128 clock messages from channel zero. With an active A3028E, you should see 512 messages per second from the transmitter. Watch the reception for a few minutes. When the Channel Receive light starts blinking, the number of messages received will drop in the Recorder Instrument. Does it vary dramatically? If reception is, for example, 100% for three seconds, and 30% for ten seconds, you have local interference power turning off for three seconds, and on for ten seconds. Connect Faraday Enclosure If you have a Faraday enclosure such as the FE3A, connect your long antenna cable to the outer socket of the enclosure's BNC bulk-head connector. Open the enclosure. Connect the short BNC cable to the inner side of the feed-through. Connect the antenna to the open end of the short cable. Put an upturned plastic cup on the floor of the Faraday enclosure. Put a transmitter on top of the cup. Close the enclosure. You should get perfect reception within the enclosure. Move the cup to a new place and repeat. Try placing it ten centimeters from one of the corners. There should be a place you can put the cup where reception is less than 95%. But such places should be hard to find. In most places, reception should be over 98%. Connect Additional Antennas: If your Faraday enclosure has more than one BNC bulkhead, or if you have more than one Faraday enclosure, connect more antennas to the data receiver. The Octal Data Receiver (A3027) has eight independent antenna inputs, and you can connect two or more antennas to each of these inputs. Test reception in your enclosures, as described above. If you get less than 95% reception anywhere in the enclosure, with the transmitter on a plastic cup, there is a problem with the system that needs to be fixed. When you arrange multiple antennas in a Faraday enclosure, make sure they are separated by at least 30 cm and they are each at least 5 cm from the conducting walls of the enclosure. For an example of three antennas arranged adequately in an FE2F enclosure, see here. Exercise the Neuroarchiver: Select the Neuroarchiver Tool from the Tool menu in the LWDAQ Software. The Neuroarchiver is the tool you will use to record transmitter signals to disk, process those signals into summary measurements, and navigate through data archives to examine recorded signals. All these actions are explained in the manual. Follow the Neuroarchiver's own set-up instructions and begin recording your transmitter signals to disk, with simultaneous play-back of the live signals. Let the Neuroarchiver run for a few minutes. Experiment with the frequency and voltage displays. Test Continuous Data-Taking: Consult the Interval Processing section of the Neuroarchiver Manual. Create a text file on your computer that contains processing instructions to record reception and power in a few frequency bands. Select this processor in the Neuroarchiver and enable processing. With one or more transmitters in your Faraday enclosure, record their signals for several days. Process and display the data as it is being recorded. The data acquisition should proceed without interruption. Measure Reception: Consult the Interval Analysis section of the Neuroarchiver Manual. Download the Reception Average script and paste it into the LWDAQ Toolmaker. Select the channel numbers of your active transmitters. Set the averaging period to an hour. Press Execute to Apply the analysis to all the characteristics files you recorded in the previous few days. You will get the average reception hourly for several days. Plot a graph of reception in Excel or whatever program you like. You should see at least 95% reception on average, more likely 98%. Use the Reception Failure script to look for periods of <80% reception. How often do these occur? Such reception failures are the result of interference penetrating into the system through power supplies and network cables. Save the list of failures in a text file. Select this file as the Events file in the Neuroarchiver and use the event navigation buttons to view the failures in detail. You may see hundreds of spurious messages from non-existent channels during the failures. In passing through all the above steps, you will have learned how to use the system in detail, and you will be ready for your experiments. If you do not follow these steps before you begin your experiments, you will be in a rush to solve any hardware or software problems you encounter. We do our best to send you working equipment and bug-free software, but we make mistakes. We do not want our mistakes to cause you unnecessary inconvenience. The Octal Data Receiver (A3027) plugs into a Long-Wire Data Acquisition (LWDAQ) system. It acts as a LWDAQ device. We use the data receiver with the LWDAQ Driver with Ethernet Interface (A2071E). The A2071E connects to the Internet, your Local Area Network, or directly to your computer via an RJ-45 Ethernet socket. You communicate with the A2071E, and therefore the data receiver, via TCP/IP. On the computer you use for data acquisition, you run the LWDAQ software, which you can download from here. Download the latest version of the LWDAQ software from here. To help you with installation and use of the LWDAQ software, consult the User Manual. With the Subcutaneous Transmitters and Data Receiver, you will use the Recorder Instrument and Neuroarchiver Tool. The Recorder Instrument is a set of routines that run inside the LWDAQ program. You can use the routines by opening the Recorder Instrument window from the Instrument menu. You can call the routines from the LWDAQ's console. The Recorder Instrument software downloads blocks of binary data from the data receiver hardware and divides them into blocks of fixed time-duration. It displays transmitter signals as it receives them, each transmitter trace in a different color, and prints a summary of the received signals to the screen. The Neuroarchiver Tool uses the Recorder Instrument to download signals from the Data Receiver. The Neuroarchiver downloads, filters, displays, and stores to disk selected signals from the data receiver hardware, and does so using the Recorder Instrument as an intermediary. The Neuroarchiver calculate and display the Fourier Transform of the incoming signals. It stores data and transforms to disk. 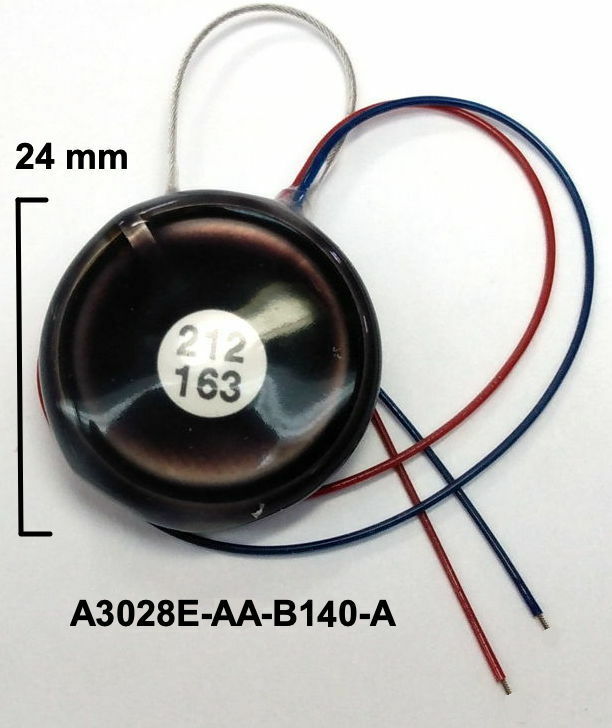 [04-MAR-16] The Subcutaneous Transmitter (A3019) provides one analog input channels by means of two flexible, insulated stainless steel flexible wires. In the A3019A, this input is low-pass filtered by a three-pole active filter with roll-off of at 160 Hz and high-pass filtered by a single-pole filter with roll-off at 0.2 Hz. Its dynamic range is 20 mV. The A3019A can detect a 5-μV sinusoid of any frequency between 5 Hz and 160 Hz, and measure its amplitude with 1-μV accuracy. The A3028 is a two-channel transmitter with similar performance, depending upon how it is configured. All transmitter models digitized at with sixteen-bit precision. The A3019A and A3028A digitize each input channel at 512 SPS. Each sample is transmitted in its own, isolated, 7-μs radio-frequency message. Transmission takes place through a dedicated loop antenna. The A3019A and A3028A transmit in the 902-928 MHz ISM band. It uses two frequencies to represent two logic levels. The messages propagate through space as radio waves. See How Antennas Work in our Technical Proposal for an explanation. The power transmitted by the antenna during the 7-μs burst is roughly 300 μW (−5 dBm). The transmitter's analog circuits operate continuously to amplify and filter its analog signals. But the logic and RF circuits are inactive almost all the time. In the case of our A3019A, the logic and RF circuits wake up for 7 μs every 1953 μs, which is 0.36% of the time. During this 7-μs burst of activity, the transmitter converts its single analog input into a sixteen-bit number, and transmits this number, together with some synchronizing bits, the transmitter's four-bit ID, and a checksum. We call this transmission a message. The A3019A's message rate is 512 per second. Within each message, the transmitter sends bits at the bit rate. The A3019 and A3028 bit rate is 5 MBPS, or 200 ns per bit. For more details of the message encoding, see below. The radio-frequency (RF) messages are received by our Loop Antenna (A3015). The messages are joined in the antenna by RF signals from other sources of similar frequency. The messages and the interference propagate along a coaxial cable to the Data Recorder (A3018) or Octal Data Receiver (A3027). The signal power arriving at the antenna must be at least four times (12 dB) greater than the interference power from other radio-frequency sources, and at least 25 pW (−76 dBm) if there is no interference. Interference power of 10 nW (−50 dBm) in the 902-928 MHz band is common in urban areas, at which level, the receive antenna must receive at least 40 nW, which we cannot rely upon when the transmitter is implanted in a moving animal, even if the receive antenna is no more than 30 cm from the animal. In order for reception to be reliable in the presence of 10 nW of interference, we must place the transmit and receive antennas inside a Faraday enclosure to reduce the interference power below 1 nW. Faraday enclosures such as our FE2F provide at least a factor of ×1000 (30 dB) isolation from external interference, and so make it possible to obtain reliable recordings with one antenna from up to fourteen cohabiting animals. Larger, less restrictive Faraday enclosures offer isolation of 10 dBm, and with the help of multiple, independent antennas connected to the same data receiver, we obtain reliable reception despite prominent interference. The radio signal enters the metal enclosure of the data receiver and connects to the RF input of a demodulating receiver (such as the A3017). The RF messages and interference are amplified by 20 dB and passed through a bandpass filter that rejects signals outside the 902−928 MHz. What remains are the messages and ISM-band interference. These are amplified by another 20 dB and enter a mixer, which downshifts the 902-928 MHz RF signal to a 38-64 MHz intermediate-frequency (IF) signal. The IF signal passes through three limiting amplifiers. Each provide 22 dB of gain, and limit their output. When we disconnect the antenna, the signal on IFL is random, but not quite saturated. When we connect the antenna, the RF interference in our laboratory causes IFL to saturate almost all the time. Because IFL is saturating, its amplitude is constant. Only its frequency changes. The fixed-amplitude IFL passes into a tuned circuit called the discriminator. The discriminator attenuates the lower IF frequencies, so that its output amplitude depends upon the frequency of IFL. The discriminator output passes into a full-wave demodulator. The demodulator turns the AC signal into a signal proportional to the AC amplitude. The demodulator output is D in the S3017_2 schematic. 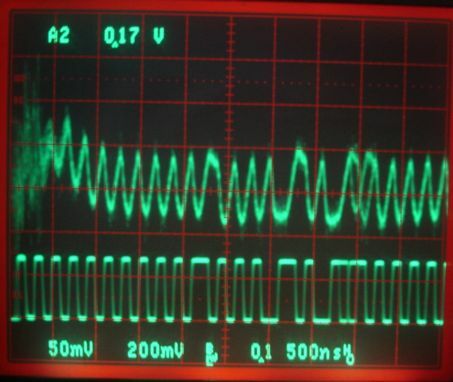 The alternating radio frequencies of the transmitter messages appear in D as a square wave. Figure: SCT Message as Seen at Demodulator Output (D, Upper Trace, 200 mV/div). Also shown is the bit sequence from the SCT circuit producing the messages (Lower Trace, 2 V/div). The D signal is mildly band-pass filtered by two RC networks to form the signal S in the S3007_1 schematic. The transmitter messages appear in S as a square wave centered about the 0-V potential. Figure: SCT Message as Seen at comparator input (S, Upper Trace, 50 mV/div). Also shown is the bit sequence from the SCT circuit producing the messages (Lower Trace, 2 V/div). The central horizontal graduation on the screen is 0 V.
A comparator transforms S into a logic HI when S is above 0 V, and logic LO when it is below 0 V. The comparator output is called C. The logic levels of the original transmitter message now re-appear as logic levels on C. Outside the messages, C is a random or pseudo-random sequence of logic levels. It is random when the dominant source of RF power at the antenna input is electronic noise, and pseudo-random when the dominant source is interference in the ISM band. Figure: SCT Message as Seen at Comparator Output (C, Upper Trace, 2V/div) and at SCT Test Point (Lower Trace, 2V/div). Note random values of C before the transmitter builds up output power. The C logic signal passes into the data receivers's logic chip, where it is synchronized with a 40-MHz message clock. The synchronized version of C is SC. It changes only on the rising edges of the message clock. Pulses on C that take place between these rising edges do not appear in SC. The data receiver monitors the stream of bits on SC, looking for messages embedded within the stream. These messages could arrive at any time. Messages can also appear in the SC bit sequence by chance, as a result of thermal noise or interference. We call these bad messages. The data receiver stores any messages it detects in its 512 KByte first-in first-out buffer as thirty-two bit records, as we defined by the SCT message encoding. The last eight bits are a timestamp, which counts cycles of the data receiver's 32.768 kHz clock. The data receiver stores clock messages 128 times per second in among the SCT messages. The clock messages take the form of a transmitter message from a transmitter with ID zero. The sixteen-bit data of a clock message is a sixteen-bit counter that increments by one with every clock message stored. The final eight bits are a timestamp, which is always zero, because the clock messages are stored whenever the data receiver's 32.768 kHz cycle counter wraps around to zero. You can think of the clock messages as being the product of a virtual transmitter with ID zero, transmitting 128 messages per second, and whose data is a counter that increments from one message to the next. The data receiver connects to the LWDAQ. The LWDAQ in turn connects to an Ethernet. Your data acquisition computer runs the LWDAQ software and communicates with the LWDAQ by TCPIP. The LWDAQ software on your data acquisition computer uses its Recorder Instrument to download blocks of messages from the data receiver's first-in first-out buffer. It plots these messages on the screen, including the clock messages. The Recorder provides you with blocks of data that cover a time interval you specify. As it acquires data, the recorder makes no effort to eliminate bad messages or insert substitute messages. Its data blocks are therefore of variable memory-size, but fixed time-duration. The Neuroarchiver Tool calls the Recorder to supply fixed time-duration data blocks. The Neuroarchiver records all data downloaded from the Data Receiver and stores it to a file. The file contains the raw values downloaded, with no processing or alterations made, and also provides a substantial metadata field for text data describing the recording. The file is arranged in our general-purpose NDF file format. Meanwhile, the Player section of the Neuroarchiver will read, process, and display recordings from any NDF file, including the one that is receiving the freshly-downloaded data. We tell the Neuroarchiver which channel numbers we want to reconstruct and display. Each channel corresponds to a transmitter recording. A two-channel transmitter will have two consecutive channel numbers for its two signals. Our subcutaneous transmitters have channel numbers between 1 and 14. Channel number zero is reserved for the Data Receiver's clock messages. Channel number 15 is reserved for slow communication, such as command acknowledgement in our Implantable Sensor with Lamp. The reconstruction of each channel from the raw data involves removing bad messages and inserting substitute messages where necessary. The Neuroarchiver displays the reconstructed channels and their discrete Fourier transforms. When playing back an archive, the Neuroarchiver will perform processing on the signals, so as to calculate metrics for event classification, export the signal to another recording format, or determine the total power in various bands of the signal spectra. The bit rate is the rate at which the transmitter sends bits during one of its message transmissions. The A3019A, for example, transmits a total of 40 bit-values in 8 μs. The bit rate is 5 MBPS (megabits per second). We describe the function of these bits in the Message Encoding section here. With the exception of a few temporary, slower versions we made for the following tests, all Stage Four and Stage Three circuits run at 5 MBPS. Here we compare the performance of the Stage Four system at 5 MBPS and 2.5 MBPS and show that the gain in operating range we make by dropping the bit rate is slight, while the loss in operating life is significant. We set up a Demodulating Receiver (A3017) with a SAW Oscillator (A3016SO) and Data Recorder (A3007C). We connected a Dipole Antenna (A3015B) on a 240-cm (96") coaxial cable (RG58C/U). We recorded messages from a Subcutaneous Transmitter (A3013). We configure the transmitter and data receiver for message transmission at 5 MBPS (200 ns per bit), then for 2.5 MBPS (400 ns per bit). The switch between bit rates requires the following changes. The transmitter logic must be re-programmed. The data receiver logic must be re-programmed. Capacitor C4 must be 1 nF for 5 MBPS and 2 nF for 2.5 MBPS (see schematic). We measure a variety of performance parameters for each bit rate. We present our measurements in the following table. Table: Performance of SCT at 2.5 and 5.0 MBPS. The blocked message rate is the rate at which we lose messages even when the signal is strong. We can lose messages because the data receiver is half-way through accepting a bad message when the valid message arrives. The missing message rate is the rate at which we lose messages due to inadequate signal strength. The 5 MBPS and 2.5 MBPS transmissions perform best with a modulation depth of ±4 MHz. The 90% power bandwidth of the 5 MBPS messages is 18 MHz, which leaves us with at least 8 MHz of extra room in the 902-928 MHz band. The power bandwidth of the 2.5 MBPS messages is 13 MHz. In theory, the narrower the bandwidth, the less likely a hole in the reception caused by interference (such as the this) will lie within the transmission bandwidth, and therefore the less likely that the transmission will be corrupted by interference. The biggest benefit of the lower bit rate is a 50% increase in operating range. The biggest cost of decreasing the bit rate are the increase in active current. The current rises from 75 μA to 108 μA. The operating life drops from nine weeks to six weeks. Another cost of decreasing the bit rate is the increased transmission time, which means a greater probability of collisions between multiple transmitters sharing the same receiver. The probability of collision between any two transmitters on any given message transmission is 0.7% at 5 MBPS and 1.4 % at 2.5 MBPS. With ten transmitters, each would lose 7% of its samples at 5 MBPS and 14% at 2.5 MBPS. Our system can handle a 30% loss of messages. At 2.5 MBPS we would use up most of this missing message budget in the normal operation of ten transmitters. We decided to stay with a 5 MBPS bit rate. Our collaborators at ION stated that battery life and bandwidth were more important than operating range, because in either case the operating range appears to be greater than the size of a standard rat cage. [24-JAN-17] The subcutaneous transmitters encode ones and zeros in a frequency-modulated radio signal. The signal consists of two frequencies separated by roughly 8 MHz, and both within the 902-928 MHz band. The transmitter messages are a sequence of ones and zeros sent with Manchester Encoding. We first described the SCT message structure here. Each message begins with eleven bits of value one (1). These bits serve two purposes. They synchronize the receiver clock with the message clock, and their exact period serves to distinguish the start of a transmitter message from random noise. The message body begins with a start bit of value zero (0). After the start bit comes the lower four bits of the transmitter's eight-bit channel number. The most significant bit comes first. The sixteen-bit sample comes next, most significant bit first. After the sample comes a four-bit completion code. The completion code is a function of the channel number, and allows us to deduce the upper four bits of the channel number from the lower four bits. The message contains no checksum. The primary means by which the data receiver picks out genuine messages from interference and noise is through close examination of the timing of the signal. The encoding of the message produces a frequency transition every 195-215 ns. If a transition fails to occur, the receiver will abort decoding and look for another sequence of sychronizing bits. In our experience, each bit that satisfies the timing constraint makes it three times less likely that the message will turn out to be a bad message arising from interference or noise. Where C is the completion code, N is the lower four bits of the channel number, and S is the upper four bits of the channel number, also called the set number. It would have been simpler to replace the completion code with the set number in the message encoding, but the completion code was othe one's complement of a channel number in the original four-bit channel number system. The completion code allows us to retain backward compatibility with the original system. The original system is equivalent to a system that uses only set zero. The following table gives examples of set numbers, channel numbers, and completion codes. Figure: Example Completion Codes for Set and Channel Numbers. We reserve channel number 0 for clock messages, and call it the clock channel. Clock messages are generated by the data receiver only. Clock messages are stored among the transmitter data messages. We reserve all channel numbers for which the lower four bits are 0 for other future internal use. 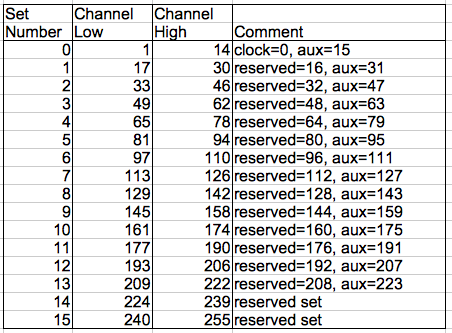 We reserve all channel numbers for which the lower four bits are 15 for auxiliary data. We call these auxiliary channels. Each set has its own auxiliary channel. We reserve channel numbers 224-225 for future applications. Figure: Channel Number Ranges for Available Set Numbers. In the Recorder Instrument and the Neuroarchiver Tool, we refer to signals by their channel numbers. The Recorder Instrument allows us to configure data receivers to select only one set, which we specify with a set number. By default, the Recorder Instrument attempts to configure its data receiver to record from all sets. We introduced channel numbers 16-223 in January 2017. A firmware upgrade will permit any data receiver to record from the higher channel numbers. An Octal Data Receiver (A3027E) with firmware version ≥11 can be configured to receive from any single set zero (0) through thirteen (13), or from all sets zero through thirteen (0-13) simultaneously. We configure the data receiver with the daq_set_num parameter in the Recorder Instrument. When this parameter is 0-13, the data receiver accepts messages only from the corresponding set. When this parameter is "*", the data receiver accepts messages from all sets. Note: There are some advantages to recording from only one set. Suppose we have a large Faraday enclosure around an IVC rack containing forty animals each with a transmitter implanted. We want to know which transmitters are turned on. Our A3027 data receiver has channel activity lights numbered 1-15. All channel numbers with remainder 1 when divided by 16 will illuminate the first activity light. When we select only one set, we can be sure of which channel number corresponds to which light. Furthermore, we reduce the amount of data we must download. We could have four independent data receivers recording from four sets of ten transmitters. The auxiliary channel number light is blue on the A3027, while the other lights are white. There is no activity light for the reserved channels or for the clock channel. Data receivers store transmitter messages as four-byte records. The first byte is the transmitter channel number. The next two bytes are the sixteen-bit data and the last byte is a timestamp. The timestamp counts periods of the data receiver's 32.768 kHz clock. The timestamp returns to zero 32768 &div; 256 = 128 times per second. Whenever the timestamp returns to zero, the data receiver inserts a clock message into the data. The clock message has zero for its channel number, this being the clock channel. 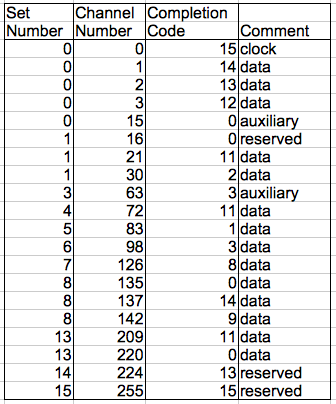 Its sixteen data bits are a counter that increments by one from one clock message to the next. Its final byte contains the data receiver firmware version number. The auxiliary channels allow variants of the SCT, such as the Implantable Sensor with Lamp (A3030C), to transmit acknowledgments and other slow data. An SCT with an on-board accelerometer or thermometer would be able to use the auxiliary channel to send slow data without interfering with EEG transmission. An auxiliary message begins with the four bits of the number fifteen, followed by sixteen content bits, and then the completion code, calculated as above. The sixteen content bits begin with four bits for the identifying number of the transmitter that sent the auxiliary message. Because the completion code implies the set number, and we have an auxiliary channel number set aside for every set of channel numbers, we need only specify the identifying number to specify which transmitter in the set is using the auxiliary channel. This will be a number between one (1) and fourteen (14). Now come four field address bits, which indicate what the final eight bits, the data bits, contain. We reserve field addresses zero (0) and fifteen (15) for future use. Field address one (1) means this auxiliary message is an acknowledgement, and the byte following is the acknowledgement key. Field address two (2) means this message provides synchronization: the byte following is the SCT's internal timestamp at the time of transmission. The Recorder Instrument supports auxiliary channels by diverting their contents into an auxiliary message list. Each element in the list is itself a list of four numbers: the channel number of the signal source that generated the auxiliary message, the field address, the data bits, and a timestamp. The timestamp is the value of the data receiver's 24-bit clock, which counts up at 32.768 kHz, so that the precision of the clock is ±15 μs and the clock cycle is 512 s.
Much of our discussion concerns itself with robust radio-frequency reception. We define reception robustness as the fraction of the time during which we receive 80% or more transmitted messages while the transmitter rotates and moves randomly at a particular range. Our sample rate and filtering is designed to tolerate the lost of 20% of the samples without loss of signal quality. We define robust reception as reception with robustness 95% or higher. In other words: signal quality is degraded by loss of samples for less than 5% of the time. A transmitter's operating range is the maximum range from the receiving antenna at which reception is robust. We use Faraday enclosures to guarantee robust reception at ranges up to 300 cm in all laboratories. A transmitter's operating life is the maximum time for which the transmitter can provide robust reception in the absence of ambient interference. Its collision tolerance is the maximum number of transmitters of its type that can share the same receiver and still obtain robust reception in the absence of ambient interference. The data receiver can fail to identify the message in its incoming bit stream (see Signal Path), even though they are received clearly by the Demodulating Receiver. The data receiver might be occupied with something that looks like a message, and when the real message arrives, all it knows is that the previous message was invalid. The recorder goes back to looking for a new message, but is too late to identify the real message. We measure the rate at which the data receiver loses messages by putting a single transmitter next to the antenna and watching for missed messages. Our signal is strong and there are no other transmitters to collide with it. We assume that any missing messages have been lost in the data receiver. It turns out that the number of synchronizing bits that the data receiver requires at the beginning of a message is what dictates the missing messages rate. Table: Dependence of Missing Message Rate upon Number of Synchronizing Bits Required by Data Receiver. Only after it has received its required number of synchronizing bits does the data receiver proceed to message recording, and it will lose an incoming message only if it is already recording a false message. By insisting upon five synchronizing bits, we ensure that the data receiver loses less than one in a five hundred messages. As it turned out, we settled upon 11 synchronizing bits because this improved the performance of the system when the signal was weak. We placed a single transmitter within a Faraday enclosure, on an upturned paper cup 10 cm from the antenna within a Faraday enclosure. We recorded continuously for an hour. Average reception was 99.7%. When we turn off the transmitter, the bad message rate is less than 0.1%. We conclude that roughly 0.3% of message are being blocked. Each transmitter, when active, transmits messages in a continuous stream. The A3019A transmits 512 sixteen-bit data samples per second. A message that the data receiver fails to receive is a missing message. The Neuroarchiver Tool handles missing messages by creating a substitute message with equal data sample value to the previous message received from the same transmitter. It does this only for the channels you are recording. Despite the Neuroarchiver's message substitution, missing messages degrade the effective bandwidth and quality of our received signals. But they do not cause catastrophic problems, nor do they confuse our data acquisition system, which can rely upon a guaranteed stream of messages from each transmitter it monitors. The primary cause of missing messages is lack of signal strength at the antenna when compared to ambient interference power, as we discuss in Ambient Interference. The primary cause of loss of signal strength is cancellation of the RF signal by its own reflections arriving at the antenna, as we discuss in Operating Range. The primary source of ambient interference is cordless phones operating in the 902−928 MHz band, and mobile phones operating in the frequency bands immediately above and below the 902−928 MHz band. Even if such mobile phones transmit only 1% of their power outside their designated frequency bands, they will still combine to produce substantial interference in neighboring bands. Another source of interference is other subcutaneous transmitters, in which case we refer to the interference as a collision. Mobile phone interference in the ION laboratory in London, which is on the eighth floor of a building, was so severe that reception from an implanted transmitter at range 50 cm would sometimes drop as low as 20%, and was rarely above 80%. With the help of one of our Faraday enclosures, reception jumped up to an average of 99%, with a minimum of 98% during any four-second period. Noise and interference can generate messages on their own. We call these bad messages. Bad signals can raise false alarms, spoil the scale of self-adjusting displays, and wreak havoc with your Fourier Spectrums. We have made every effort to avoid them. Bad messages have a valid transmitter ID number, but their data is invalid. The Recorder Instrument rejects them when they occur with ID numbers you have not asked it to record. The bad message rate in our laboratory is less than one per ten minutes when there are no transmitters active. In London, the bad message rate was roughly one per second, sometimes coming in bursts of ten in a second. With transmitters active, we find that some messages get corrupted, as we describe below, and these message become bad messages. We spend the rest of this section showing how bad message can, in theory, arise from noise and interference, and how our message encoding makes such bad messages very unlikely. As we describe in Signal Path, the data receiver monitors a logic signal called SC, looking for messages. These messages could arrive at any time. If the stream of bits is random, there is a chance it will generate a message by chance. If the stream of bits has some pattern to it because of radio interference, the chance of a message appearing in it at random might be much higher. When we disconnect the data receiver's antenna, and replace it with a 50-Ω terminator, we stop radio signals from reaching our receiver. All that remains at the input to our RF amplifier is white noise, whose power in our radio-frequency passband is around −87 dBm. The receiver amplifies this noise until it is large enough to generate an active pattern of zeros and ones on SC. This alternation is random, because the white noise is random. The output of the Demodulating Receiver (A3017) is an analog signal, S. This signal is sharply bandwidth-limited by the Demodulating Receiver's radio-frequency passband, and mildly high-pass filtered when it enters the data receiver. 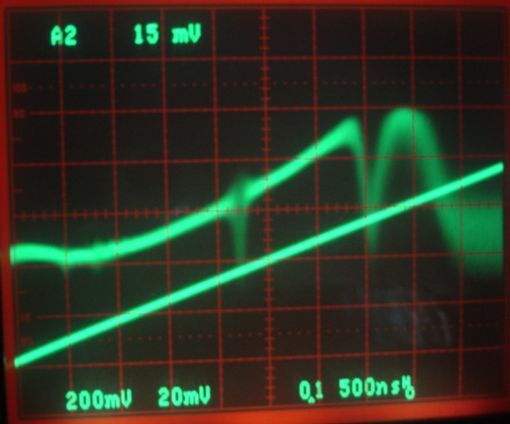 The data receiver uses a comparator to generate the logic level SC from S. When we examine SC on an oscilloscope with the antenna disconnected, the bandwidth of the bit stream is around 10 MHz, which we determine with the help of various low-pass filters. Our messages represent individual bits values as edges in SC, not as levels of SC. An edge is a transition from logic LO to HI or from HI to LO. A rising edge is a one, and a falling edge is a zero. A sequence of synchronizing one-bits at the beginning of the message tells the data receiver when to look for data-carrying edges, because it knows the rising edges in the synchronizing sequence are the data edges in these initial one-bits. Every subsequent data-carrying edge allows the data receiver to adjust its expectations for when the next data-carrying edge will arrive. With a 5 MBPS bit rate, the data-carrying edges are separated by 200 ns. Each bit takes roughly 8 periods of our 40-MHz message clock. We say "roughly" because the bit rate is not exact. The transmitter's message clock is generated by a ring oscillator, and is accurate to only ±10%. If the data receiver detects an edge within one or two clock periods of another, it rejects the entire message and goes back to looking for synchronizing bits. It rejects synchronizing bits using the same constraint. The data receiver tests the level of SC for premature edges twice during each bit period. In order for a random sequence of bits to create a valid message, it must satisfy both tests for all bits of the message. There are around 25 bits in the message, so the random stream must take on the correct value 50 times. Furthermore, the message must have the correct checksum at the end, which is the same as saying that it must take the correct value for another five bits. The likelihood of a random sequence on SC matching our message protocol is roughly 0.530. To the first approximation, there are 105 opportunities for the match to occur every second, because each message occupies roughly 10 μs. We expect our bad message rate from noise and random interference to be of order one per hour. And indeed this is what we observe: after running for ten minutes we saw no bad messages with the antenna disconnected. Most interference, however, is not random. It is generated by communication devices and its purpose is the transfer of information in a regular fashion. Such interference can have a far greater probability of creating a bad message than random interference. In a basement laboratory with −68 dBm interference power in the 902-928 MHz band, we recorded the number of bad messages in consecutive one-second intervals with a Data Recorder (A3018C). We used no Faraday enclosure, and no transmitters were running nearby. Figure: Occurrence of Bad Messages with −68 dBm Interference. The average number of bad messages per second was 1.1 and the standard deviation was 2.5. Given that we expect to receive of order 500 messages per second from active transmitters, this bad message rate is not significant. A corrupted message is one that has been interfered with, but which still passes through our error-checking. A corrupted message has the same effect upon data acquisition as would a bad message with the same ID. We can reduce the likelihood of message corruption by checking for errors in the content of the message, as opposed to only by comparing the final four bits to the first four bits. A four-bit cyclic redundancy check at the end of all transmitted messages would give us better rejection of corrupted messages. Instead of ending up as bad messages, most corrupted messages would end up as missing messages. But the cyclic redundancy check would make our Stage Four transmitters incompatible with those of Stage Three, so we decided to tolerate a higher than necessary corrupted message rate for the sake of backward-compatibility. The text below is a list of messages between one clock message and the next, taken from data recorded from a system with six active A3013A transmitters (starting time 71.0625 s in archive M1288538199.ndf). Each line represents one message, either a clock (ID 0) or a sample (IDs 1 to 14). We give the message index, the channel number, the sample value, the timestamp, and the hexadecimal representation of the four message bytes. These messages were recorded inside Faraday enclosures, so interference from non-SCT sources is minimal. Message 30 is a corrupted message from No12 in which the ID has remained the same. This corruption gives rise to a glitch in the No12 signal. Message 33 has ID 4, but there is no No4 transmitter in the system. We suspect that a message from No5 was corrupted in such a way as to appear as a message from No4. The above errors occur more often when the signal from one or more transmitters is exceptionally weak. The errors manifest themselves as spikes in the signal. Because they are rare, we can remove them with a glitch filter. More of a problem than the spikes is the poor reception that goes with the weak signals that cause spikes. [27-JAN-17] When two transmitters send a message at the same time, we say that they collide. When two transmitters collide, we can lose one or both of their messages. Consider message detection by a single antenna amplifier, as is the case with our original Data Receiver (A3018). If the first message is much more powerful than the second message arriving slightly later, the second will be lost. The second message will become a missing message. But the first message will be received correctly. If the second message is more powerful than the first, it will interfere successfully with the first, preventing its reception. The second message may also be lost, depending upon how fast the message detector can recognize and recover from the corruption of the first message. If the two signals are of equal power, neither will be received. If we have two or more independent receiving antennas, we can hope to detect both messages. The Octal Data Receiver (A3027) provides eight receiving antennas, each with its own amplifier, demodulator, and message detetor. Collisions occur at each of the antennas, but the outcome of the collision differs from one antenna to the next, so that the rate at which we lose messages to collisions is reduced. Collisions occur because two transmitters are transmitting at the same time. If the transmission period were exactly regular, and two clocks drifted into exactly coincidence, collisions could occur systematically at every transmission instant. But the transmission period is not regular. The average period is exact, but the moment of each individual transmission is displaced by the transmitter by a small, random, amount of time. In the A3038E, the transmission period is 64 cycles of its 32.768 kHz clock, or 1952 μs. The A3028E delays its moment of transmission by 0 to 15 clock cycles, so that the actual moment of transmission can be delayed by up to 456 μs. Or we can regard the moment of transmission as being displaced by ±240 μs about its nominal value. We call the displacement of the transmission instant transmission scatter. We describe how the data acquisition system handles transmission scatter in our Recorder Manual. The transmitter uses the lower four bits of its sixteen-bit ADC conversion as the source of a random number. We describe in more detail how the hardware implements the scatter in the Transmission section of our A3013 Manual. The figure below shows transmitter scatter on the oscilloscope screen. Figure: Transmission Scatter. The transmitter's sample frequency is 512 Hz. 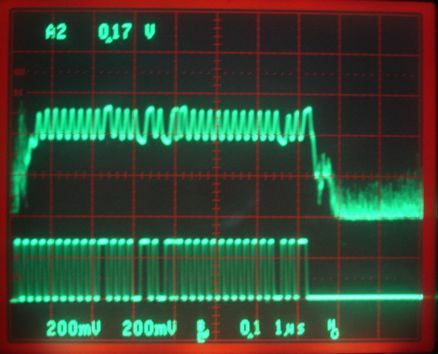 The oscilloscope triggers on one message and then displays the next. The delay between the two messages is the sum of two instances of transmission scatter. By default, all transmitters take sample N+1 immediately after transmitting sample N, so the moment of sampling is likewise displaced by the transmission scatter. When we reconstruct the signal for processing, we assume the samples are taken uniformly. Suppose we are looking at a 1-mVpp 10-Hz sine wave with a 512 SPS A3028E transmitter. The maximum slope of the sine wave maximum slope is 31 mV/s. The maximum displacement of the sampling instant is 240 μs. The maximum change from nominal to actual sampling instant is 240 μs × 31 mV/s = 7 μV. The diplacement of the sampling instants appears as noise of maximum value 7 μV and standard deviation roughly 4 μV. This is small compared to the A3028E's electronic noise of 12 μV rms. For a simulation of scatter noise performed by Marco Leite, see here (by Marco Leite of ION/UCL). The spectrum of the sample-displacement noise, being random and independent from one sample to the next, is "white" or "flat with frequency". We call it scatter noise. We apply a 14-mVpp sinusoid to the input of an A3028E transmitter. We record the signal. We subtract the fundamental harmonic and measure the power of what is left, which we call the non-fundamental power. We calculate the ratio of non-fundamental power to fundamental power, which we call the distortion of the original signal. We measure distortion with increasing frequency for both scattered sampling and uniform sampling. Figure: Distortion in A3028 Recordings. We plot the ratio of non-fundamental power to total power for a sinusoidal input. One plot is for a device with scattered sampling, the other for a device with uniform sampling. Most devices use scattered sampling to extend battery life. 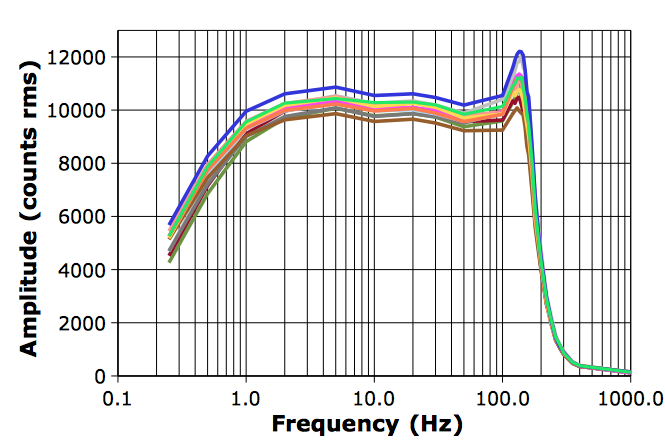 With scattered sampling, the distortion is less than 1% in the 0.3-160 Hz pass-band of the A3028E amplifier. At 10 Hz and below, distortion is less than 0.01%. But the distortion is almost entirely scattering noise. If we sample uniformly, distortion is less than 0.003%. With uniform sampling, the non-fundamental signal is dominated by other sinusoids. We cannot tell if these arise in our amplifier or are present in the original sinusoid, but the figures below show the spectrum of the non-fundamental power with uniform sampling. Figure: Spectrum of Non-Fundamental Signal. Left: 5 Hz 7-mV fundamental, 700 nV/div, 5 Hz/div. Right: 100 Hz 7-mV fundamental, 700 nV/div, 25 Hz/div. Calculated from 8-s intervals with windo function turned off. The peak that goes off the screen is the fundamental. Note the harmonics and offset harmonics. Uniform sampling increases current consumption by 10% (for example, the A3028D with regular sampling consumes 152 μA, while the A3028D with scattered sampling consumes 135 μA). Given that scattering noise does not distort the shape of the fundamental sinusoid, and given the chaotic nature of most biopotential signals, there is no practical benefit in reducing the scatter noise below 1%, while there is a practical benefit to increasing operating life by 10%. Faraday enclosures provide isolation of transmitters from ambient interference, and also from transmitters that do not share the same receiver. If we have eight transmitters in four separate Faraday enclosures, each Faraday enclosure will have its own antenna. We combine the signals from the six antennas and feed the combination into our Data Receiver (A3018) using an Antenna Combiner (AC4A). Transmitters in these six enclosures will interfere with one another whenever their transmissions overlap. At 512 SPS, the transmission period is 1952 μs and the transmission itself lasts for only 7 μs. Each transmitter transmits for 0.35% of the time. The chance of one 7 μs transmission overlapping another is 0.7%. The average loss due to collisions when we have n transmitters sharing the same receiver is (n-1) × 0.7%. If we have If we have twelve transmitters sharing a receiver, we will lose roughly 8% of messages to collisions when averaged over a long time period. We say the average collision loss is 8%. But the collision loss varies with time, as shown in the following graph. Its average value may be only 0.7% for two transmitters, but it's peak value can be ten times higher. Figure: Cyclic Changes in Message Reception from Two A3013A Transmitters. Transmitter No4 has been running for 6 weeks in a jar of water. Transmitter No7 is new and in air. Average reception from No4 is 98.9% and from No7 is 99.5%. In the above graph, we see cyclic variation in reception caused by a slight difference in the transmitter clocks. Over the course of eighteen minutes, the cycles grow in amplitude from 1% to around 8% and shrink again. Another twenty minutes goes by with no evidence of collisions, and the collision cycles begin again. The period of message transmission at 512 SPS is roughly 2 ms (64 cycles of the transmitter's 32.768 kHz oscillator). An entire collision sequence, such as the thirty-six minute sequence captured in the figure above, takes place as the two clocks drift with respect to one another by 2 ms. The ASH7KW clock we use on the A3028 is accurate to ±20 ppm over its entire temperature range. We expect differences between the clocks of 5 ppm to be common. In the example above, it takes 2200 s for the two clocks to drift apart by 2 ms. The two clocks differ by 0.9 ppm. This combination of clocks is unusual. More often we see collision cycles of period several hundred seconds, like this one taken from transmitters in live animals at ION in London. The individual cycles in the above sequence have period thirty seconds, as we can see in the following figure. Figure: Cyclic Changes in Message Reception from Two A3013A Transmitters. 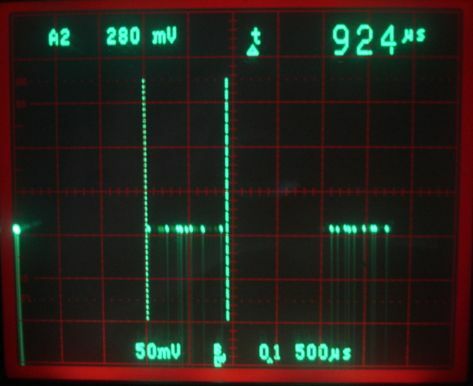 Detail from figure above showing 500 s to 600 s.
Each cycle corresponds to a drift of 30.5 μs between the two clocks (one period 32.768 kHz). Because our clocks are only 0.9 ppm apart, we get a 34-s cycle. We see the structure of the cycle clearly. There is a 18-s period with no collisions in each cycle, and a 16-s period where the collisions take place. The first period of collisions in the entire collision sequence begins when the earliest transmission window of one transmitter coincides with the last transmission window of the other. In our case, the two 7 μs windows overlap for 16 s (that's twice 7 μs divided by 0.9 ppm). Collisions in this first period should be rare, because only one window overlaps. The chance of a collision should be 1/16 × 1/16 = 0.4%. 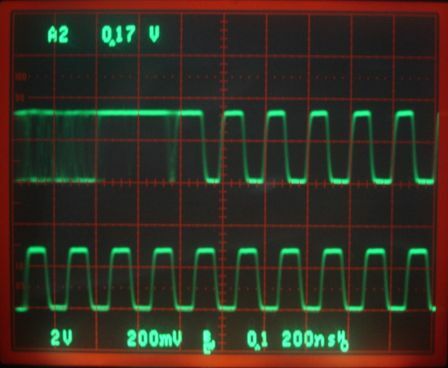 As we see in the oscilloscope trace above, the four-bit values the transmitters use for random numbers are not uniformly-distributed across their sixteen possible values. Furthermore, one transmitter might be so much stronger than another that the interference is only one-way. In our example sequence, we see the first cycle has a depth 6% for No4 and 0% for No11. The peak cycles have depth 8% for both transmitters. The second cycle of collisions occur 34 s after the first, when the clocks have drifted 30.5 μs to the next window overlap. Now the earliest window of one transmitter coincides with the second-to-last last window of the other. But now we have the second-earliest window coinciding with the last window as well. Our chance of collision is, in theory, 0.8%. The overlap lasts for 16 s, and 18 s later comes the next overlap. The chance of a collision is 1.2%. On the sixteenth cycle, all sixteen windows overlap, and the collision probability is 6%. The cycles shown in detail in the figure above are the largest in the collision sequence. Both transmitters experience a 6% drop in reception. Sixteen cycles after the peak, none of the windows overlap. The clocks drift another 1 ms apart over the next 1200 s and there are no collisions. Now the entire sequence starts again. If we place n transmitters in the same Faraday enclosure, it is inevitable that their sixteen transmission windows will coincide at some point in time. At that time, the collision rate between transmitters will be at its greatest, and reception will be at a minimum. If we consider a message occurring in one of the windows, the probability of no other message occurring in the same window is 0.94(n−1). If we assume near-perfect reception in the absence of collisions, which appears to be the case in Faraday enclosures, this probability is the minimum reception rate for the n transmitters. Table: Theoretical Reception for Colliding Transmitters and One Receiving Antenna. The maximum possible number of transmitters that can share a single receiver is 14 because only channel numbers 1 to 14 are available. For robust reception we need to receive more than 80% of messages for 95% of the time (robustness of 95% or higher). It's not obvious from the minimum and average reception values whether reception will be robust. To obtain a good estimate of robustness, we simulated the collision cycles of n transmitters. Our simulation program, collisions_1.pas, simulates sets of n transmitters working together with randomly-distributed clock periods over a period of two thousand seconds. The figure below shows reception from the first four transmitters in a set of fourteen. Figure: Simulated Collisions for Four Out of fourteen Transmitters for One Receiving Antenna. For detail, see here. For simulated collisions of four out of four transmitters, see here. When the simulation begins, all clocks are synchronous, and we obtain the minimum reception. After that, the interactions between the clocks become complex. For a 100-s detail, see here. For each simulation of n transmitters, we obtained n values for minimum reception, average reception, and robustness. These values were consistent from one transmitter to the next to within a few percent, so the values we give in the table below are the average values taken over the n transmitters. Table: Simulated Reception for Colliding Transmitters and One Receiving Antenna. We performed the simulation once only for each value of n because. For the higher values of n, the simulation takes several minutes and occupies over 100 MBytes of memory. Robustness is greater than 95% all the way up to n = 12, so the collision tolerance of a set of 512 SPS transmitters is 12. This is why we talk about 12 transmitters sharing a single receiver in other sections. Robustness for n ≤ 5 is 100%. In our simulation, we assume that any collision between two transmitters will result in the loss of both messages. This is not true in practice. If the power received from one transmitter is 12 dB greater (16 times greater) than the power received from another, the more powerful signal will dominate. If reception of the more powerful signal is taking place, the weaker signal will be ignored. If the weaker signal is being received, there is a good chance that the receiver will have time to abandon the weaker message and receive the stronger message. In our recording of two stationary transmitters, shown here, we see that fewer messages are lost from No7 than No4. Transmitter No7 is in air with an 80 mm antenna. Transmitter No4 is in water with a 50-mm antenna. We assume the signal from No7 is stronger than that from No4. The following graph shows measured transmission over the course of half an hour with nine active transmitters. Figure: Measured Reception from Nine Transmitters with One Receiving Antenna. The transmitters are all A3013As, transmitting at 512 SPS, clustered around the antenna with no Faraday enclosure. Data recorded in archive M1281707240. Average reception over the half-hour period was 92% for No3 and 99% for No1, with the others in between. The minimum reception observed in any four-second period was 71% from No2 and 94% for No1, with the others in between. Reception is almost always greater than 80% for all transmitters, so we conclude that we obtain robust reception from nine transmitters despite collisions. All these calculations assume that we have only one antenna amplifier and demodulator with which to detect all transmitted messages. But the Data Receiver (A3027) provides eight independent antennas. When two transmitters collide but are in different locations, both messages are likely to be received correctly because at each location one transmitter dominates over the other. We placed nine transmitters in a Faraday enclosure, emitting a total of 8192 SPS, and received their messages with three independent antennas. Our simulation suggests a loss of around 12% of messages due to collisions at each of the antennas, assuming reception would be perfect otherwise. In practice, we observe an average loss of 4%. We define operating range as the greatest range from the pick-up antenna at which we obtain robust reception. An A3019A transmits 512 messages per second, so the operating range is the greatest range at which we receive 410 or more messages per second in 95% of orientations and positions at the operating range. In practice, we operate the transmitters inside a Faraday enclosure, so their operating range must be adequate to cover the range from the antenna in the center of the enclosure to the farthest corner of the enclosure volume. When we hold a transmitter between two fingers in our basement laboratory, and move it around randomly at range 100 cm for a minute (see movie), we receive 98% of the messages it transmits. The operating range of the A3019 is greater than 100 cm in our basement laboratory. In our our office in the center of Waltham, operating range is closer to 70 cm. Operating range in the ION laboratory in London appears to be around 30 cm. The decreasing operating range is the result of ambient interference, which dominates transmitter messages whenever the transmitter signal is attenuated by reflections and unfavorable orientation. Regardless of the operating range of transmitters in a laboratory, we recommend the use of enclosures with conducting walls to block out ambient interference. Such enclosures are called Faraday cages. We call them Faraday enclosures so we don't get them confused with animal cages, which are used to contain animals. We discuss ambient interference below, and we describe the performance and construction of Faraday enclosures in our Faraday Enclosures report. Because Faraday enclosures give us at least a 30-dB (one thousand-fold) reduction in ambient interference, they increase the operating range of our transmitters by a factor of 30 (square root of one thousand). Even if the operating range is only 10 cm without a Faraday enclosure, it will be 300 cm within a Faraday enclosure. We expect robust reception from transmitters operating within an enclosure 500 cm × 500 cm × 200 cm, provided the antenna is in the center of the floor of the enclosure. Our FE2A enclosure is far smaller than this. Robust reception within a Faraday enclosure appears to be guaranteed. Nevertheless, we always benefit from increased signal strength compared to ambient interference, and we have worked hard to increase the operating range of our transmitters in the absence of Faraday enclosures. We devote the remainder of this section to a discussion of what phenomena limit the operating range of our transmitters. The discussion explains why we use a poorly-tuned loop antenna to receive our transmitter signals, and why we use a poorly-tuned bent antenna to transmit them. 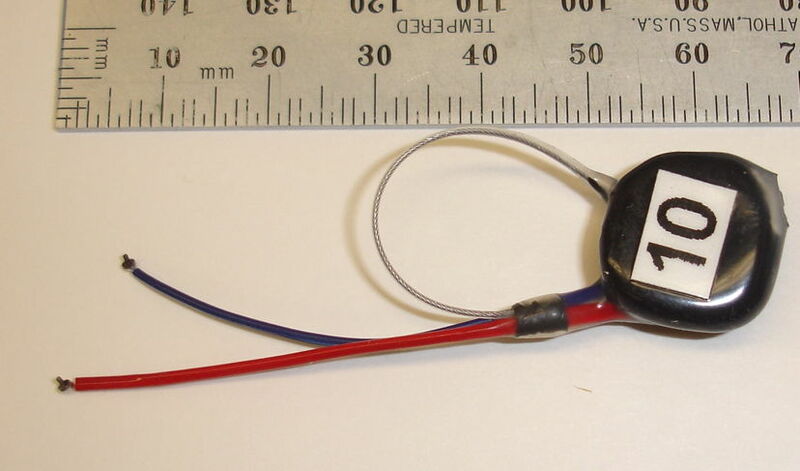 When we implant a transmitter in an animal, the 50-mm antenna of an A3013A-E will resonate more efficiently, and so transmit more power (see Antenna Length). We may lose some or all of that additional power by absorption in the animal's body (see Transmitter in Baby Rat Corpse). We compared the operating range of the Data Receiver (A3010B), which is the Stage Three receiver upgraded with new firmware and an antenna socket, and the Data Receiver (A3018A), which is the original Stage Four receiver. (The original Stage Three receiver, the A3010A, suffered from a firmware bug that reduced its performance even farther with weak signals.) We used the same Subcutaneous Transmitter (A3013A) for both receivers. We used the same Loop Antenna (A3015A) for both receivers. We unplugged it from one receiver and plugging it into the other. At range one meter in air, with the transmitter held between two fingers, and rotating in all directions at random for ten seconds, the A3010B (Stage Three Upgraded) lost ≈ 6% of messages. The A3018A (Stage Four) lost <1%. We placed the transmitter 7 m away in a randomly-chosen location. The A3010B (Stage Three Upgraded) lost 75% of messages. The A3018A (Stage Four) lost 2%. We were able to receive messages from up to 14 m away with the A3018A (Stage Four), but no more than 7 m away with the A3010B (Stage Three Upgraded). It appears that our Stage Four development has doubled the effective range of the transmitters. We claim that we are nearing the physical limits of message detection, as we shall now explain. The noise in our receiver is the thermal and amplifier noise at the antenna input. The interference is RF power in the receiver's pass-band arriving at the antenna from transmitters other than those the receiver is intended to receive. The effective noise power at the input of our demodulating receiver is −90 dBm (see Noise and Interference). But interference power, even in our basement laboratory, is over a hundred times more powerful than this noise, at −68 dBm (see Noise and Interference). Our transmitters produce roughly −4 dBm (see Radiated Power and Modulating Transmitter). Transmission across 1 m of air with can drop our received power to −53 dBm. This −53 dBm is still more than 12 dB above our interference power of −68 dBm. But we must contend with multi-path interference as well, which give rise to reception dead spots. With the antenna in an unfavorable orientation, in which we receive only −53 dB from line-of-sight transmission, we have power radiating more effectively in other directions. This power can reflect off nearby conducting surfaces and arrive at the receiving antenna with as much strength as the line-of-sight signal. The reflection adds to the line-of-sight signal. It might reinforce the line-of-sight signal, or cancel it, depending upon their relative phase. The phase difference between a reflected and line-of-sight wave is a strong function of frequency. If the reflected path length is three meters long, this is a hundred wavelengths. A 1% change in frequency will cause a 2π change in phase. A 0.25% change in frequency will cause a π/2 change in phase. The figure below shows two holes in the response of our our Demodulating Receiver (A3017). The antennas are 1 m apart, on either side of our body. Figure: Two Holes in Frequency Response Caused by Reflections. The linear trace is proportional to frequency. Each vertical division is 5 MHz, starting with 895 MHz on the left. The top trace is the demodulator output. We see that each hole is about 1 MHz wide. A 0.1% change in frequency causes the cancellation to stop. We take such sharp holes in the frequency response to be evidence of multi-path interference. The width of the holes is consistent with a reflected path length of several meters. Longer path lengths would give holes that were even more sharp. Aside: The two holes are separated by 24 MHz, and you will notice yet another hole, on the left side, which is 24 MHz below the middle hole. As the frequency changes by 24 MHz, the phase difference between the line-of-sight and reflected waves changes by 2π. The number of wavelengths in the path difference changes by one. Because the frequency changes by 2.5% to bring about this one-wavelength change, the path difference must be 40 wavelengths, or 12 m. This suggest to us that the wave is bouncing off one of the metal shelves five or six meters from our transmitting antenna. If that's the case, then the reflected signal will be about 25 dB weaker than the line-of-sight signal, except for the fact that our body is in the line of sight. Human tissue attenuates 900 MHz by approximately 1 dB/cm, so we expect a loss of around 25 dB through a human torso. Both signals are each strong enough for reception, but they cancel one another at particular frequencies. With 10 dB loss due to cancellation by reflections occurring at the same time as 17 dB loss due to poor antenna orientation and 32 dB loss due to transmission across 1 m of air, our signal drops to −63 dBm, which is only 5 dB above our −68 dBm interference. Reception will fail. With a favorable orientation of the transmitter, however, we can expect −36 dBm at 1 m, and − 56 dBm at 10 m. Even at 10 m, we can receive a signal that is 12 dB above our interference. In fact, we find we can get reliable reception at up to 15 m in our lab by orienting the transmitter properly. Radio frequency power from sources other than our subcutaneous transmitters is what we call ambient interference. If it's large enough, ambient interference can dominate the transmitter signals and cause missing messages. In early 2009, we determined that our operating range in the ION animal laboratory in London was only 25 cm, after observing a 50-cm operating range for most of 2008 (details in this e-mail). A range of 25 cm is not adequate to cover even a single animal cage, let alone four at once. We assumed that ambient interference was to blame for the the short operating range, and began to look at ways to block ambient interference from reaching our receiving antenna. We can block out ambient interference with a Faraday enclosures, which is a box with electrically conducting walls. There can be holes in the conducting walls, but the holes must be less than 1% of the wavelength of the radiation if we want to block 99% of the power. In our case, the wavelength in air is around 300 mm, so holes less than 3 mm will be fine. 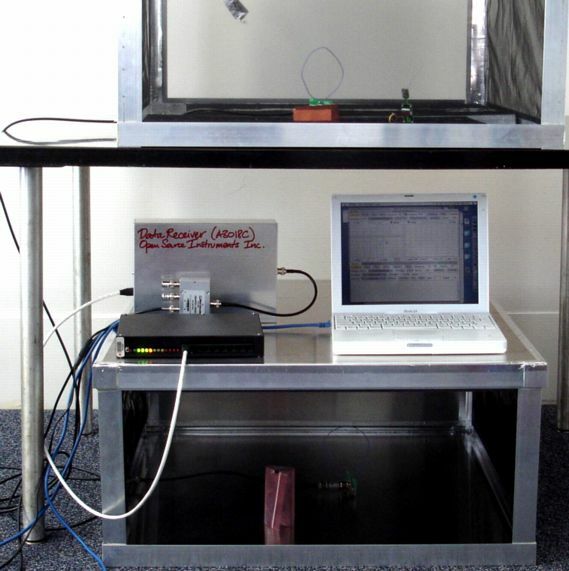 We describe our experiments with home-made Faraday enclosures in our Faraday Enclosures report. Another way to block ambient interference is to turn your entire laboratory into a Faraday enclosure. You can paint the walls, ceiling, and floors with shielding paint. You could cover the windows with aluminum mosquito mesh, or make curtains out of shielding fabric. Alternatively way to block ambient interference is to move your animal laboratory into a basement with a concrete ceiling. Our FE2B Faraday enclosure sells for around a thousand dollars US. It is large enough to contain two rat cages. Four litter-mates could live together in each cage, each with an implanted transmitter. We believe this is the most cost-effective way of performing long-term studies. Ambient interference can penetrate the recording system through the cable that joins the data receiver to the LWDAQ Driver. To cut down on such penetration, we must use a shielded LWDAQ cable for this connection, as we describe in Shielding. Our transmitters provide high-fidelity EEG recording. The figure below is an example of the frequency response graphs we obtain during quality control of all batches of transmitters we manufacture. Figure: Frequency Response of Fourteen A3028Es. For similar plot of response of four dual-channel A3028Ds, see here. When we drop a transmitter in water, we are able to measure the noise on its biometric inputs. For most transmitters, this noise is of order 10 μV, depending upon the amplifier gain. This noise sometimes contains a periodic ripple of a few microvolts amplitude that is generated by the micropower magnetic sensor on the transmitter circuit. We guarantee that this switching noise amplitude is less than 5 μV rms. Distortion of a sinusoidal signal applied to the input of one of our transmitters takes two forms. One is a white noise generated by scattered sampling of the signal, as we describe above. The power of this noise is less than 1% of the power of an applied sinusoid. The other is harmonic distortion and the introduction of periodic noise by the transmitter circuit. The power of these harmonics adds up to less than 0.003% of the power of an applied signal. See the Analog Inputs section of our A3028 Manual for a detailed discussion of the analog inputs. See our Mains Hum report for more on the origins of mains hum. Our transmitters pick up no measurable mains hum when implanted in animals. The electrodes measure the difference in potential between two parts of the brain. Mains hum tends to operate upon the entire animal body. Furthermore, with the introduction of Faraday Enclosures to isolate transmitters from radio-frequency interference, we find that the transmitters are isolated from mains hum as well. We encapsulate transmitters in epoxy and coat them in silicone. For an account of our initial work on rugged encapsulation that is resistant to water, fatigue, and vacuum, see our here. Our encapsulation procedure does not use molds. We dip the circuits in epoxy while in a vacuum, and then allow air into the vacuum to force the epoxy in and around all components. We rotate the transmitter while the epoxy cures, and later dip several times in a medical-grade silicone dispersion to provide a resiliant outer coating. Encapsulating by dipping produces a far smaller device, and we can adapt our procedure easily to new shapes. The disadvantage of epoxy and silicone is that they are permeable to water vapor, so that it is possible for water to condense within the circuit. In the warm body of an animal, condensation causes corrosion. We select transmitters from those we manufacture, and subject them to accelerated ageing tests in hot water, where they run for weeks or months until corrosion stops them from functioning. These tests suggest that the minimum time our devices can remain implanted without any degredation of performance due to corrosion is at least two years. [26-FEB-19] Our electrode leads are a flexible helix of stainless steel wire insulated in silicone. We describe how we arrived at this design in Flexible Wires. We make the following varieties of lead. You may specify which lead you want when you order transmitters, or you can leave it to us to choose the best diameter for your target animal. We order our springs in 150-mm sections, which makes it easy to manufacture leads up to 150 mm long. We can make longer leads by joining two 150-mm leads together. The 0.5-mm diameter lead we use with our smallest transmitters, those with volumen less than 1.0 ml, such as the T and P series devices. 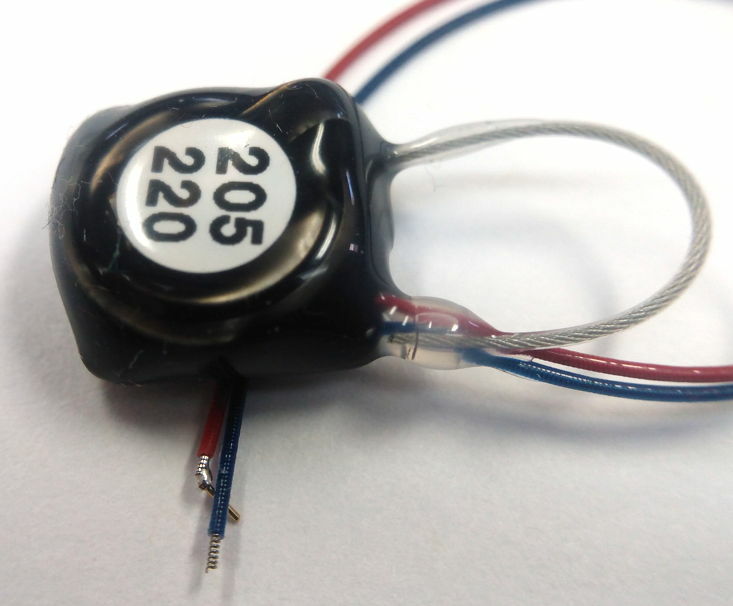 The 0.7-mm leads we use with transmitters larger than 1.0 ml. The 1.0-mm leads we stopped making some time ago. The fatigue resistance and strength of the leads is governed by the wire inside the insulation. The wire in the 1.0-ml lead is the same as the wire in the 0.7-ml lead. The 1.0-mm lead, being larger, is more likely to irritate the animal. When we reduced the diameter of our leads from 1.0 mm to 0.7 mm, we noticed a sharp drop in the number of reports we received of skin irritation over the paths of the implanted wires. The 0.5-mm lead is half the volume of the 0.7-mm lead, which is important in the smallest animals. But the wire in the 0.5-mm lead is one half the diameter of the wire in the 0.7-mm lead, so the spring itself is one quarter as strong. The 0.5-mm leads must be handled with care. They will survive the fatigue of animal movement, but they are easy to damage with a scalpel during implantation or extraction. [29-JUN-18] The active current consumption of a transmitter increases linearly with the number of samples it transmits per second. Divide the capacity of the battery by the active current conusmption to get the maximum number of hours of operation the device can provide. Figure: Active Current Consumption versus Total Sample Rate for Device with Scattered Sampling. Blue line is all A3028 versions except the A3028P series. Orange line is A3028P series. The operating life of a transmitter is how long it takes to consume its battery capacity in its active state. The A3028E provides 1 voltage-sensitive input (for EEG), 1 magnetic field input (for turning the transmitter on and off), and one radio-frequency output (for transmitting messages to the receiver). During radio-frequency transmission, the A3028B consumes around 10 mA, which would run its battery down in one day. But transmission takes place only 1% of the time, so current consumption is reduced by a factor of one hundred. The transmitter trusts that the receiver will be listening all the time, and with such vigor as to pick out messages from a dozen different from a continuous, random message background. The transmitter consumes 75 μA. The receiver consumes 20 W. We have moved the complexity and power consumption of communication into the receiver, out of the transmitter, and this is why our transmitters last for hundreds of times longer than any other radio-frequency telemetry devices on the market. These other radio-frequency systems use transceiver chips that set up continuous reception and transmission between the implanted device and its recorder. Figure: Examples Discharge Curves for Lithium Primary Batteries. We discharge five CR1025, 30-mAhr, 3-V cells with five A3028P3 transmitters, channel numbers given in legend, each consuming ≈75 μA, expected life is 400 mH-hr, observed life is 391-410 hr. We measure VBAT by taking the average of one second's worth of X samples. The average value of X corresponds to VCOM, which is 1.8 V. From this we deduce VBAT, which corresponds to a X = 65535. The shelf life of a transmitter is how long it takes for the transmitter to consume its battery capacity in its inactive state. When a transmitter is inactive, its magnetic switch consumes some current. 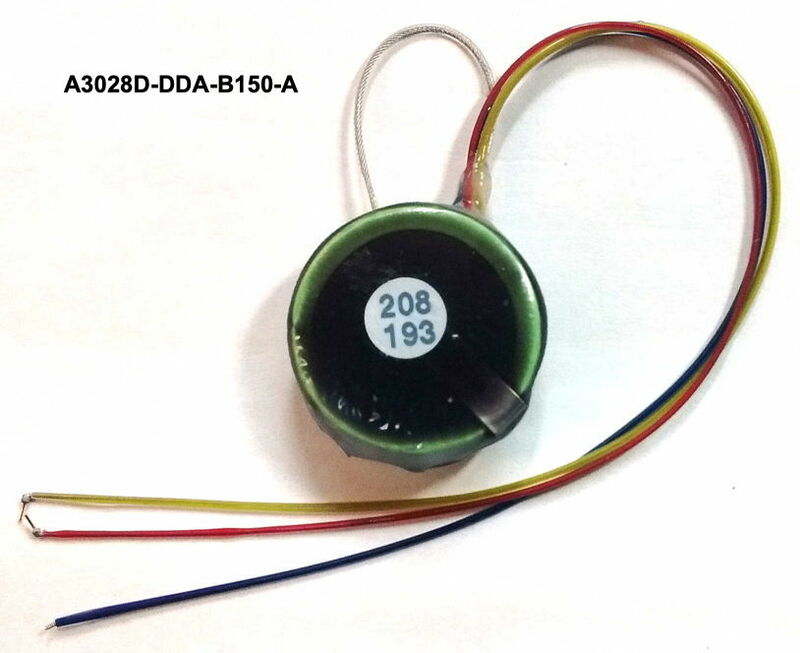 In the A3028A, the switch consumes around 1.5 μA. In the A3028P it consumes around 0.8 μA. The A3028A is equipped with a BR1225 with capacity 48 mA-hr. These cells last for ten years or more without losing charge. At 1.5 μA, the battery will run down in about three and a half years. Transmitters equipped with rechargeable batteries tend to have one third to one half the operating life of non-rechargeable transmitters. This is a consequence of the lower charge density of rechargeable batteries. Once explanted, however, the rechargeable transmitter can be restored to its full operating life by connecting its red X and blue C leads to a recharging circuit, as we describe in Battery Recharging. But it is easy to damage the transmitter with a faulty recharger. Send your explanted devices back to us and we will recharge, test, and repair them for you. We give the cost of the recharging service in our Price List. [29-JUN-18] We do not provide battery recharging circuits for our customers to use with their rechargeable transmitters. Battery recharging is complicated by the fact that it must take place through the resistance of the input or output leads, and through two charging diodes within the encapsulated circuit. If anything goes wrong, the transmitter circuit can be damaged beyone repair, or its battery capacity may be reduced without any outward sign of damage. Furthermore, every time we remove a transmitter from an animal, there is a chance its leads will be damaged. Sometimes this damage is hard to see, but allows water to penetrate the insulation and deliver an unwanted electrical signal to the lead half-way along its length. With the right instruments, it is possible to detect such damage, even if it is hard to see. We recommend that you send your exhausted rechargeable transmitters back to us for refurbishment. We offer our customers a recharge and test service for transmitters, as well as a lead repair service. See our Price List for the cost of these services. We use two types of rechargeable battery: lithium-polymer (LiPo) and lithium-manganese (LiMn). The LiPo battery has low output impedance and is ideally suited to our Implantable Sensor with Lamp (ISL) devices, where it can provide the tens of milliamps needed to power the lamp. We can also use them in subcutaneous transmitters, where they offer rechargeablility but provide less than half the operating life of non-rechargeable transmitters of the same volume. The LiMn batteries come in packages smaller than any other type of battery, and permit us to make our smallest subcutaneous transmitters. To recharge a transmitter, we connect the red input lead through a resistor to the positive terminal of a charging voltage, and the blue lead directly to the negative terminal. The value of the resistor and the charging voltage depend upon the type of battery and the capacity of the battery. While re-charging, we must turn off the tranmitter, because the application of the charging current disturbs its internal voltages, causing it to divert the charging current from the battery. To recharge the 5-mAhr LiMn battery of the A3028T-R transmitter, for example, we turn it off and use a 1-kΩ resistor to deliver a 4.2-V charging voltage. The battery will be fully recharged after forty-eight hours. To recharge the 190-mAhr batter of the A3028E-R, we use a 100-Ω resistor and a 5-V charging voltage. Once again, the battery will be fully recharged in forty-eight hours. [29-JUN-18] Faraday enclosures ensure robust reception from implanted transmitters. They also make sure that the SCT recording system conforms to all local radio frequency regulations. We describe the development of our enclosures in Faraday Enclosures. A single FE3A enclosure, with a transparent shelf installed, acommodates six animal cages and provide recording from at least forty cohabiting animals. Not only is radio-frequency interference kept out of the enclosure, but so is ultrasonic noise and lower-frequency electrical noise as well. Conversely, the transmitter signals are confined within the enclosure. The signal power outside the enclosure is too weak for detection, which guarantees that the system violates no local radio-frequency transmission rules. Furthermore, we can operate separate recording systems in the same room, because their signals will not interfere with one another. Acknowledgement: Almost every detail of this section comes directly from our customers. We thank them for answering our questions. We do not mention our customers by name in our public documents, out of respect for their privacy. [26-MAR-18] A transmitter and its leads must fit comfortably in an animal if the implantation is to be a success. In the experience of our customers, implanting transmitters in mice and rats of all sizes, we obtain the following rule of thumb: a mouse or rat can tolerate a single implant up to 0.07 ml per gram of its body weight, or two implants of 0.05 ml/g each. Assuming a density of 1.8 g/ml, which the approximate density of our A3028 devices, a mouse or rat can tolerate a single implant up to 0.13 g/g or two implants up to 0.09 g/g. For an independent assessment of what mice and rats can tolerate, consider the implantation of mini-pumps, such as those made by Alzet. According to Alzet, a 0.5-ml pump is accommodated by a mouse 10 g and larger, 1.0-ml is accommodated by 20 g and larger, and the 6.5-ml is accommodated by rats of 150 g and larger. Our veterinary collaborators tell us that two such pumps can be implanted in one animal without excessive discomfort. A four-week old rat weighs roughly 80 g. According to one paper, rats at age four weeks and can tolerate an implant of 5.6 ml. In our experience, a 2.8-ml A3028E is well-tolerated by an 80-g rat. But we note that an 80-g rat is growing quickly: within two weeks it weighs 150 g. Our A3028L is 6.0-ml device of mass 13 g. According to one implanter, "The A3028L is probably not well tolerated by smaller rats. When I implant in rats under 300g, if the transmitter is placed too posterior, over the femoral region it can be quite irritating. I have had two rats that scratched through the skin in this region." Male Sprague-Dawley rats reach 300 g at 8 weeks, while females reach 300 g only after 16 weeks. Most strains mice are roughly 10 g after 3 weeks and 20 g after 6 weeks. In our experience, a 20-g mouse is comfortable with a 1.3-ml A3028A, but a 10-g mouse barely tolerates the same device. We have obtained reliable recordings from rat pups only four days old using a 1.4-ml transmitter, but a better choice today would be our newer, single-channel A3028P 0.8-ml, 1.2 g transmitter. 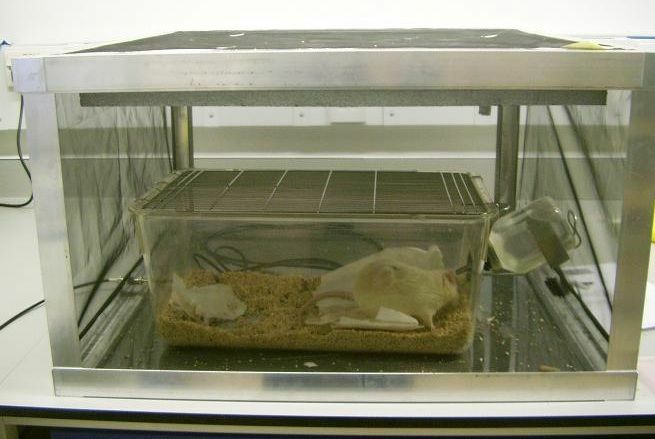 One of our collaborators measured the weight of four 28-day-old rats before and after implantation of a 1.4-ml, 2.6-g transmitter. The animals weighed as little as 55 g at the time of implantation. Transmitter volume was 1.4 ml not including leads, and mass was 2.4 g including leads. A control animal received no transmitter and was subject to no surgery. All five animals cohabited in the same cage in the week following, and we recorded EEG continuously from the four implanted transmitters. Figure: Five Cohabiting P28 Rats (Click for Movie). Four have 1.4-ml transmitters implanted using the two-incision method, one does not. Note the shaved areas around the incisions, and the stitches closing the incisions on the head and back. The transmitter is beneath the incision on the back. We run the leads under the skin to the incision in the scalp, where M0.5 screws act as electrodes through holes in the skull. Weight gain following surgery is presented in the following table. See also Chang et al. for implantation procedure and EEG recordings. Figure: Weight Gain in Young Rats After Implantation of A3019A in P28 Rats, 15-MAY-14. Control animal has no transmitter implanted. The video of the freely-moving animals, and their weight gain after surgery, suggests that a 1.4-ml implant in a 55 g animal has no significant impact upon its well-being. We do not have such weight-gain measurements for 20-g mice implanted with our 1.4-ml transmitters, but Wright et al. describe how mice of initial weight 18-22 g tolerated 1.4-ml for at least three weeks to the satisfaction of UK veterinary inspectors. We describe implantation procedures in detail in the supplementary materials of Chang et al. 2016, the first section of Wright et al. 2015, and in our original methods paper Change et al. 2011. In the text below you will find the latest details and advances in the implantation procedure. Each implanter has their own preferred method, so we supply here a collection of advice and suggestions collected from a variety of methods. We have a private collection of implantation videos that you may also find useful. These videos are, however, available only to our active customers, as agreed with the implanters who provided the videos. There are two established procedures for implantation. The two-incision procedure uses one incision in the back or side of the animal to accommodate the body of the transmitter, and a second incision in the scalp to give access to the skull. We tunnel the electrode leads under the skin to the skull. On the skull, we insert screws or wires into skull holes and fasten them in place with dental cement. Or we insert pins into depth electrodes, lower the electrodes into the brain, and secure with dental cement. The two-incision procedure works in all animals. The single-incision procedure uses one incision in the scalp large enough to slide the body of the transmitter down under the neck to the abdomen. This single-incision procedure works better in mice than in rats, because the distance the transmitter must be thrust under the skin is greater in rats. In both procedurs, we have the option of closing the incision in the scalp, or building up a head fixture of dental cement, and fastening the edges of the incision to the head fixture with n-butyl cyanoacrylate. We recommend Vetbond. Neither method is ideal. Closing the incision can create tension and irritation that leads to scratching and opening of the sutures. Leaving the incision open invites infection at the interface between the skin and the dental cement. When implanting, you may be working on steel tables with steel implements. These can become magnetic and they can turn on and off the transmitter while you are working. One way a table or a tool can become magnetic is by storing your on-off magnet on the table or the tool handle. Turning off and on the transmitter during implantation causes no harm to the transmitter, but can cause concern that the transmitter has failed when it has not. Implant the SCT with the battery facing in, so the circuit board holding the magnetic sensor is closest to the skin. Use a large magnet. The field of a small magnet will not penetrate easily through the skin. The choice of electrodes at the tip of the leads depends upon what we want to measure, as well as the size of the animal. We present our work on electrodes here, and you will find a list of currently-available electrodes here. The most important consideration when implanting an electrode is that the conducting tip of the electrode must be fixed in place with respect to the body tissue as the animal is moving. If the electrode moves with respect to the brain or skull tissue, we will see step artifacts in our EEG recording. Our objective is to reduce the number of step artifacts we see from moving animals to the point where their frequency is has no significant impact upon our automated analysis of the signal. Our Event Classifier will be fooled by no more than 5% of step artifacts, so if we want the classifier to make mistake no more than one such artifact per day for an actual EEG event, we must reduce the frequency of such steps to fewer than one per hour. Our first successful EEG electrodes were a stainless steel screw soldered to the end of the electrode lead. In mice, the skull is only 200 μm thick near the bregma. For EEG monitoring, we recommend a 0.6-mm long, 0.5-mm diameter threaded electrode. In rats, the skull is around 500 μm thick, and over the course of many weeks, will grow thicker. The screw we recommend for rats is 3.2-mm long and 1.5-mm in diameter. This screw is large enough to accommodate the growth of a young adult rat from 50 g to 200 g and still maintain good contact with the brain for consistent EEG amplitude throughout months of EEG recording. Nevertheless, soldered screws have the following disadvantages. We would like to cut the leads to exact lengths during implantation. But this is not possible if we are using a soldered screw. Turning a soldered screw into a skull hole while it is connected to a flexible lead is possible but difficult. There is a risk that the screw will snap off the lead while you twist it. Replacing a soldered stainless steel screw requires skill with a soldering iron and the right acid flux to make the joint reliable. Solder joints are not stainless: the tin and silver in the joint corrode in water and can generate their own electrode potentials. We no longer recommend soldered screws as EEG electrodes, although we will supply them when asked. Our preferred EEG electrode is a bare wire held in a skull hole by a screw. The tip of the bare wire touches the surface of the brain, or enters the brain by a fraction of a millimeter. With these bare-wire electrodes, we obtain larger amplitude EEG. Provided we take care during construction of the head fixture, the wire will be held firmly in place and we will see fewer than one step artifact per hour. Cutting the leads to the correct length, drying the skull, preparing the skull with n-butyl cyanoacrylate, covering all exposed metal with dental cement, and making sure the dental cement has time to cure before closing the incision, ensure the bare wire is stationary with respect to the skull as the animal moves around. 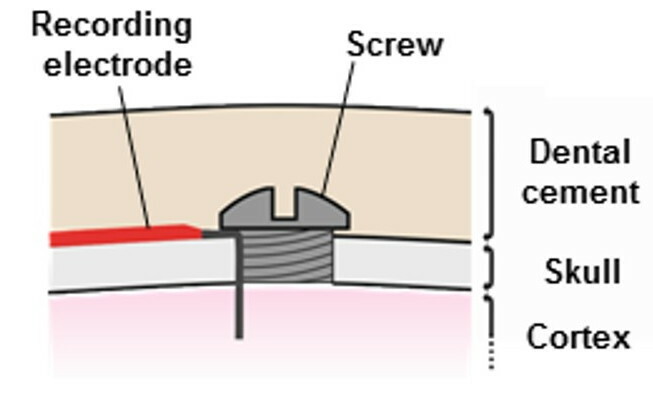 Figure: Bare Wire Electrode with Fixing Screw. When we plan to use bare-wire electrodes, we can cut the leads to the optimal length during implantation. We want to avoid one lead being subjected to more tension than another. If we have three leads running from the transmitter to the skull, one electrode might be 10 mm farther from the transmitter than another. We make its lead 10 mm longer. Now we can run the leads together in a bundle from the skull to the transmitter and no one lead will be pulled out of the bundle because it is too short, nor pop out of the bundle because it is too long. Having cut the leads to length, we must expose some bare wire at the newly-cut tip of the lead. When working with our 1.0-mm or 0.7-mm diameter leads, we can grab the exposed tip of the 100-μm diameter stainless steel wire and pull some wire out. We straighten with forceps, insert a bend for the skull hole, and trim for the desired depth of penetration from the skull surface. When working with our 0.5-mm diameter leads the wire is too fragile to extract in this way. We must cut through the insulation near the tip with a blunt scalpel and use two pairs of tweezers to pull the free end of the insulation away from the main body of the lead. This exposes a stretched length of 50-μm diameter wire that we can straighten, bend, and trim. For more on insulation removal see Solder Joints. Here is a suggestion from one implanter of bare wire electrodes. "Make sure neither screw is anywhere near muscles and that the screws and about half a centimeter of wire coming from the exposed lead is also covered by dental cement so that neither moves at all. I also make completely sure that the cement is very hard before suturing the back incision where the transmitter is so that there is no chance of anything moving before the cement dries." In recent recordings, a well-secured pair of electrodes produced zero step artifacts in ten hours of EEG we analyzed, while a poorly-secured electrode produced several artifacts a minute. One recording is easy to search through automatically for spikes and seizures. The other will be almost impossible to work with. Rats and mice scratch at incisions and other points of irritation. The electrode leads of the transmitter, running from the back to the skull beneath the skin of the neck, will irritate the animal if they are poorly routed or if they are too rigid or thick. The diagram below shows us how not to route the wires in a rat, and how best to route the wires in a rat. Figure: Correct Routing of Electrode Leads In Rats. When the wires were routed directly up the top side of the neck, half the rats scratched the leads out of their skin, which is an indication of intense discomfort on their part. When the wires were routed along the side of the neck, with enough slack, none of the rats scratched the leads out. 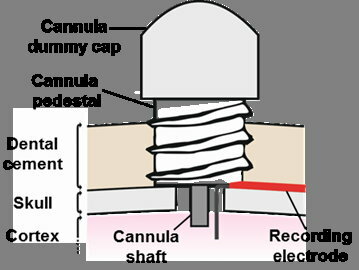 If we want to inject an agent into the brain, and record EEG near the site of the injection, we can use a guide cannula to hold the bare wire in place, provided we insulate the wire from the steel shaft of the guide cannula with dental cement. If the steel wire touches the guide cannula, the EEG amplitude will drop because the steel guide has low electrode impedance. Figure: Bare Wire Electrode with Guide Cannula. To provide insulation, we cover the bare wire with superglue, cut the end off to expose steel at the tip, bend by 90° and insert in the skull hole. We lower the guide cannula into the same hole, but separated by a few hundred microns from the bare wire, so they do not touch. The following diagram attempts to explain the arrangement. [28-NOV-18] If we end our recording before we exhaust the battery of a transmitter, we have the opportunity to remove the transmitter from the animal, clean it, refurbish the ends of the leads, and implant again. We must take care when cutting the device out of the animal, especially if the existing implantation is more than a week old. Scar tissue builds up around the transmitter, holding in place, and wrapping around the antenna and leads. The lead tips may be bound in place with dental cement. We can cut the leads or we can remove the head fixture with the transmitter leads and soak the leads and head fixture in acetone over-night to dissolve the cement. Acetone does no significant damage to the silicone of our leads. But acetone does react slowly with silicone, and we we do not guarantee that transmitters that have been soaked over-night in acetone will retain their resistance to corrosion in subsequent implants. We recommend you soak only the leads and electrodes in acetone. As we describe in Silicone and Solvents, we must wash twice with clean acetone after such a soak, to remove all traces of cement. As we describe in Insulation Removal, we can refurbish the tips of our leads by removing insluation, exposing bare stainless steel wire. If we are want to attach a screw or pin to the steel wire, we will need acid flux and a hot soldering iron, as we describe in Solder Joints. [01-NOV-16] In our Technical Proposal, we laid out our plan to develop a transmitter small enough to be implanted in the body of a rat, fast enough to transmit four hundred data samples per second, powerful enough to be detected at a range of three meters, and efficient enough to operate for three months on a lithium battery. We divided our development into four stages. The electronics of Stage Four were ready in March of 2007. It was then that we confronted the problem of robust, water-proof encapsulation for the transmitters. At the time we wrote our Technical Proposal, we believed that two coats of silicone dispersion would be adequate to protect the transmitter from water. Given the simplicity of the procedure, there would be no point in coating the transmitters ourselves. We proposed to send transmitters to our users without batteries, wires, or coating. Our user could solder their preferred wires to the transmitters, install the battery, and apply the coating. Archive Photograph: See here for photograph of the prototype electronics for Stage Four in 2007. The Data Receiver is the aluminum box with its lid off. 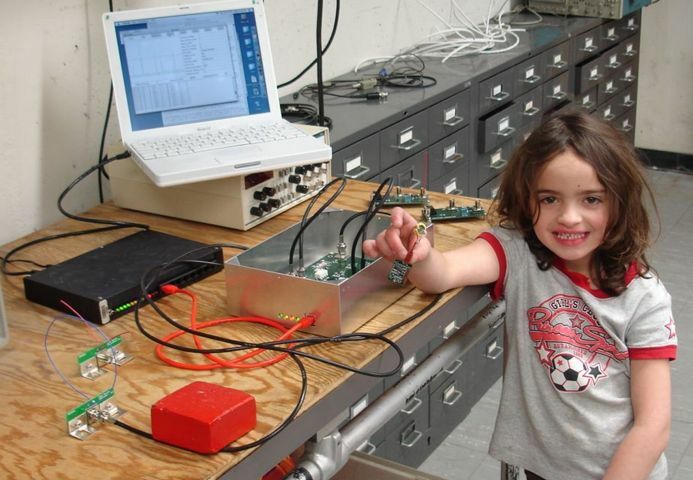 Alice is holding a transmitter (prototype version with external battery and programming connector). The loop antenna on a cable sits at one end of the table. A dipole antenna (disconnected) is next to the loop. Two Modulating Transmitters are in the background. The black box is the LWDAQ Driver, connected to our computer. All circuits shown in the picture are now obsolete, but their replacements look much the same. The LWDAQ Driver is a black box, the Data Receiver remains a silver box. Water-proof encapsulation is not straightforward. Capillary action makes water a relentless invader of any opening or crack. During encapsulation, air bubbles trapped beneath components emerge into the curing encapsulation. In the low pressure of an aircraft cargo hold, the bubble beneath the battery pushes outwards, and will burst an encapsulation made of silicone. Our work on encapsulation is an appendix to the work we committed to in our Technical Proposal. After nine months of effort, we arrived at an encapsulation process that uses both epoxy and silicone, which we called Process X. We made our first transmitters with Process X in December 2007. We describe our work on encapsulation and encapsulation methods in our Encapsulation report. We later improved Process X and arrived at Process B. We made our first transmitters with Process B in June 2009. Figure: Example Subcutaneous Transmitter System. Shown are three Faraday enclosures. One is large, perhaps 2 m square, and contains four rats living together, each with their own implanted transmitter. Two other enclosures are smaller, and contain rats and mice isolated in their own cages. There is one Loop Antenna (A3015A) in each Faraday enclosure. The antenna signals are carried by coaxial cables to a Four-Way Antenna Combiner (AC4A). One input to the combiner is unused in this example. The Data Receiver (A3018) amplifies, demodulates, and decodes the antenna signals. The Data Receiver gets its power from the LWDAQ Driver through a shielded LWDAQ Cable. The LWDAQ Driver (A2071E) downloads transmitter messages from the Data Receiver and serves them over the internet. 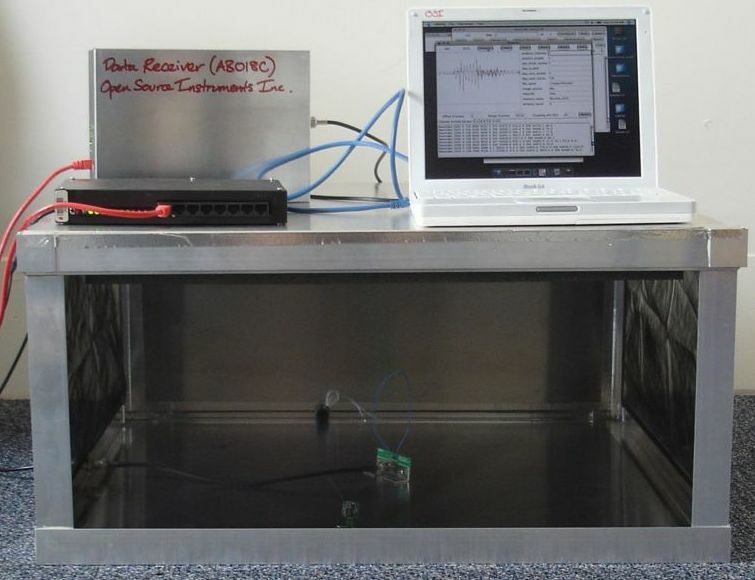 A data acquisition computer reads out transmitter messages with the help of our LWDAQ Software and its Neuroarchiver Tool. Also connected to the LWDAQ Driver in this example is a Camera (A2056), which takes photographs of the four communal mice when certain EEG signals are received. Once our transmitters were water-proof in Process X, they endured for long enough in live animals for the wires to break from repetitive stress. Wires broke at the neck of a rat, at their solder joints, and where they emerged from epoxy encapsulation. Our work on flexible wires is an appendix to the work we committed to in our Technical Proposal, and was funded in part by ION's purchase of ten prototype transmitters. We describe our work on wire fatigue in our Flexible Wires report. In Spring 2009 we began trials using a variety of steel wires, including steel springs, as we describe in the Trials section of Flexible Wires. We eventually arrived at a stranded wire for the antenna and helical steel wires for the input leads. We insulate both with silicone, and this insulation forms part of the outer cover of the transmitter body. Figure: Subcutaneous Transmitter System. Faraday Enclosures FE2B (bottom) and FE2A (top), Antenna Combiner AC4A, Data Receiver A3018C, Shielded LWDAQ Cable, LWDAQ Driver A2071E, and lap-top computer for recording and analysis. Inside each Faraday enclosure is a Loop Antenna A3015B. Black coaxial cables carry the antenna signals to the Antenna Combiner. Two unused sockets on the Antenna Combiner are capped with 50-Ω terminators. A short coaxial cable carries the combined signal to the Data Receiver. A white network cable connects the Data Receiver to the LWDAQ Driver. This cable must be shielded to prevent it from acting like a radio-frequency antenna, and it must be wired according to the LWDAQ Specification to give better immunity to static discharge. A blue ethernet jumper cable connects the LWDAQ Driver to the laptop. This cable need not be shielded. In each Faraday enclosure is a bare Subcutaneous Transmitter A3013 circuit. Interference with our subcutaneous transmitter signals from outside sources proved to be a problem in ION's London laboratory. We solved the problem of interference with Faraday enclosures. Our work on Faraday enclosures is an appendix to the work we committed to in our Technical Proposal, and was funded in part by ION's purchase of ten more prototype transmitters. We describe the development of a practical Faraday enclosure, and document its success, in Faraday enclosures. 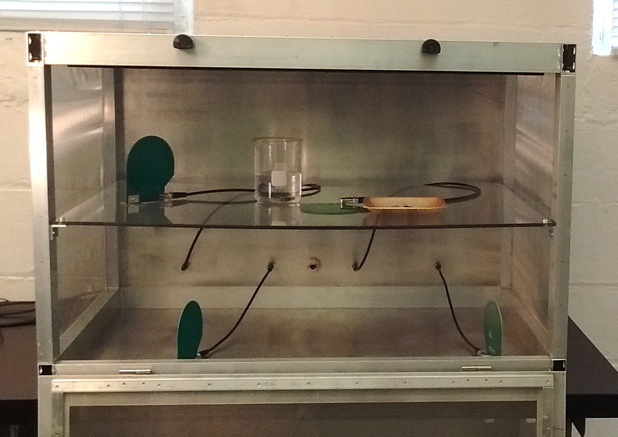 Faraday enclosures are now an integral part of the subcutaneous transmitter system. Not only do they provide immunity to outside interference, but they allow many transmitters to operate simultaneously in the same space without interfering with one another. At the end of October 2013, we had prototypes of our new Dual-Channel EEG Monitor (A3028). We were working on an automated thermo-plastic inner encapsulation for these devices, followed by silicone dipping. We were building the first of our Octal Data Receivers (A3027). At the end of January 2017, the Octal Data Receiver (A3027E) with firmware version ≥12 supports channel numbers 1-222. We can, in principle, operate 196 transmitters in the same Faraday enclosure and record data from all of them with a single A3027E. The Animal Location Tracker (A3032A) allows us to track the movements of animals over a 16 cm × 32 cm platform. Our Implantable Sensor with Lamp (A3030D) is receiving commands and flashing its optogenetic stimulator while implanted in rats. We have manufactured over two thousand transmitters to date, and are currently shipping fifty of them per month. [01-NOV-16] The A3028E is a single-channel EEG monitor with volume 2.8 ml. It is designed for use in rats. Its EEG amplifier is protected from condensation by an epoxy encapsulation, and made water-proof by a silicone coating. 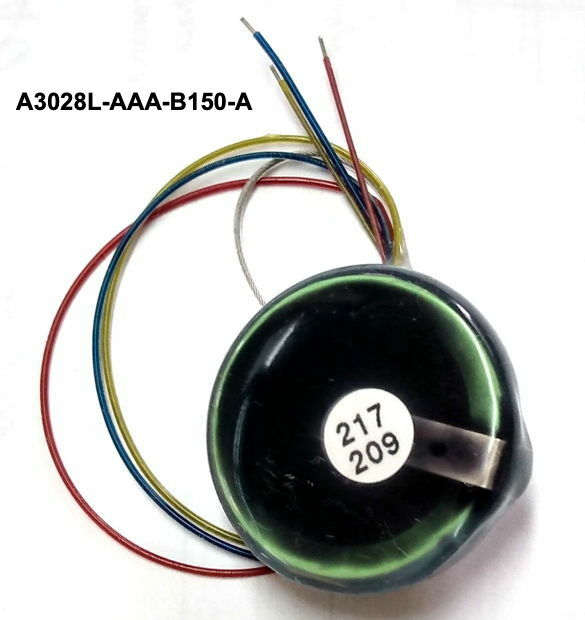 Its analog leads are steel springs insulated with silicone. Its antenna is a stranded steel wire also insulated with silicone. The encapsulation and wires will resist the fatigue and corrosive fluids within an animal's body for at least one thousand days. When active, the A3028E transmits 512 samples per second for at least 18 weeks when it starts with a fresh battery. Each sample is sixteen bits, with a dynamic range of −13 mV to +9 mV. The electronic input noise is 12 μV rms. Its frequency response is limited to 160 Hz by a three-pole low-pass filter on the transmitter. Its near-ideal differential input picks up less than 1 μV of mains hum when implanted in a live animal. The A3028A is a dual-channel 512 SPS EEG/EMG monitor designed for implantaion in mice. Its volume is 1.4 ml. Its operating life is fifteen days. The A3028L is a dual-channel 1024 SPS EEG monitor with volume 6.5 ml, which is small enough to be tolerated by an adult rat. Each channel has bandwidth 0.3-320 Hz. Its operating life is 5.5 months. Many other versions of the same transmitter circuit exist. In certain rural locations, and in certain basements, it is possible to operate a fourteen-channel SCT system with no Faraday enclosure. But in most laboratories, a Faraday enclosure is necessary to ensure reliable reception from the implanted devices. 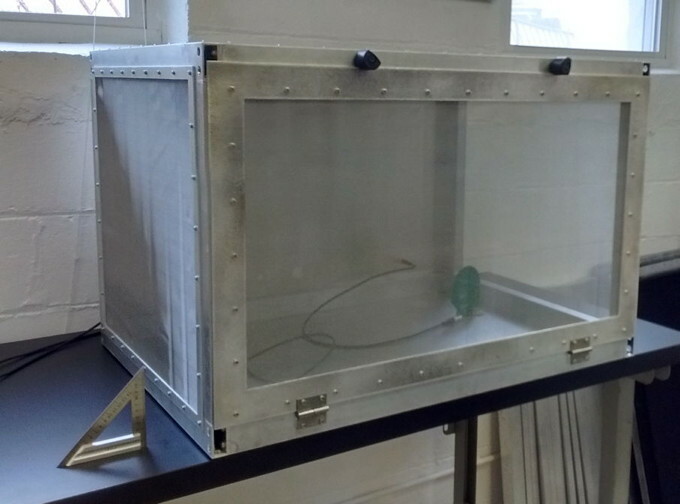 We have cooperated with customers to develop and build Faraday enclosures to suit their laboratories. We have SCT systems operating in IVC racks, with an enclosure of steel mesh fabric around the rack. We have stacks of smaller enclosures on wheels that can be moved from one laboratory room to another. Most of our customers are able to build their own enclosures after receiving a few examples from us. We describe the enclosure components and performance here. Within a larger enclosure, we can operate several SCT systems simultaneously with the help of transmitter set numbers, or we can record from a hundred transmitters with a single system. With the addition of the Animal Location Tracker (A3032A), a single SCT system can track the locations of up to fourteen animals in one or two cages. The A3032A platform is 16 cm × 32 cm, and thin enough to fit beneath a cage in an IVC rack. Its accuracy in measuring animal location is of order 20 mm, and its precision in detecting movement is of order 2 mm. The tracker makes as many measurements of position as it receives samples from the implanted transmitter. If the transmitter is running at 512 SPS, the tracker can monitor animal movements at up to 1000 mm/s. All our hardware and software is open-source, distributed under the GNU Public License. Our LWDAQ Software is free and distributed under the GNU Public License. It runs on Linux, MacOS, and Windows. The software downloads transmitter signals from the Data Receiver via a LWDAQ Driver. The connection between the computer and the LWDAQ Driver is TCPIP. Eight A3028E transmitters, each producing 512 sixteen-bit samples per second, generate only 16 kBytes/s, so a local area network, or an office wireless network, has no difficulty transferring the data for recording. Once the data has been recorded on disk, our Neuroarchiver Tool, bundled with our LWDAQ Software, provides an Event Classifier that allows us to find EEG events automatically in tens of thousands of hours of recordings. We describe our work on automatic event detection in Seizure Detection.